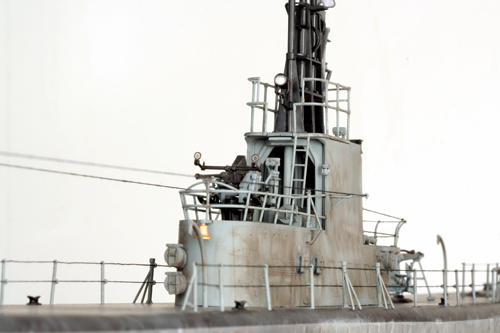 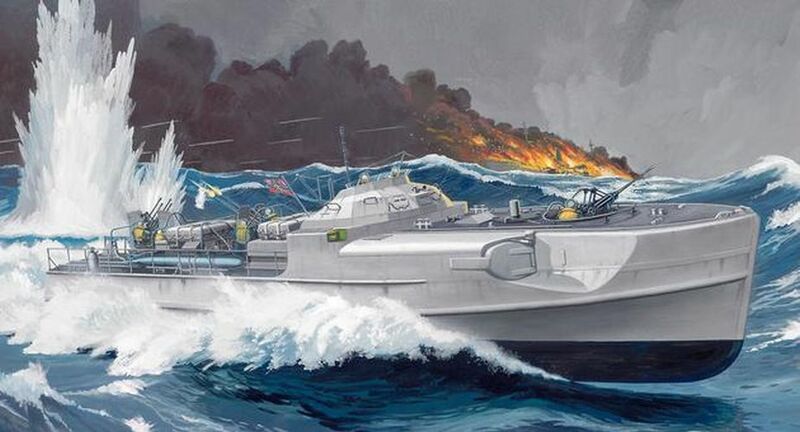 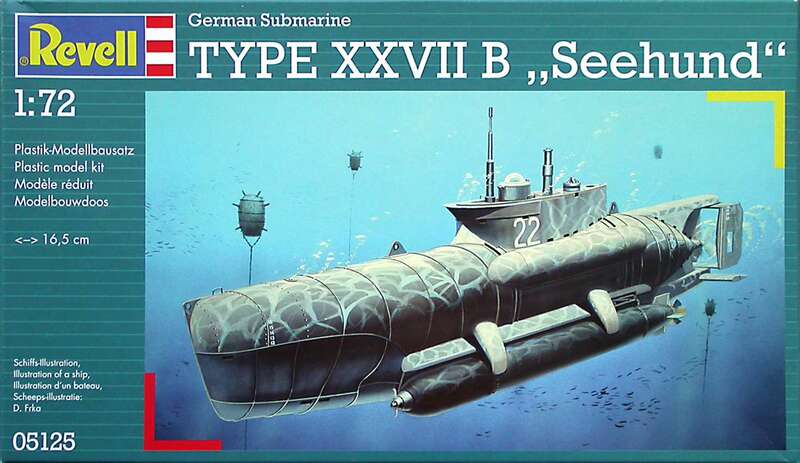 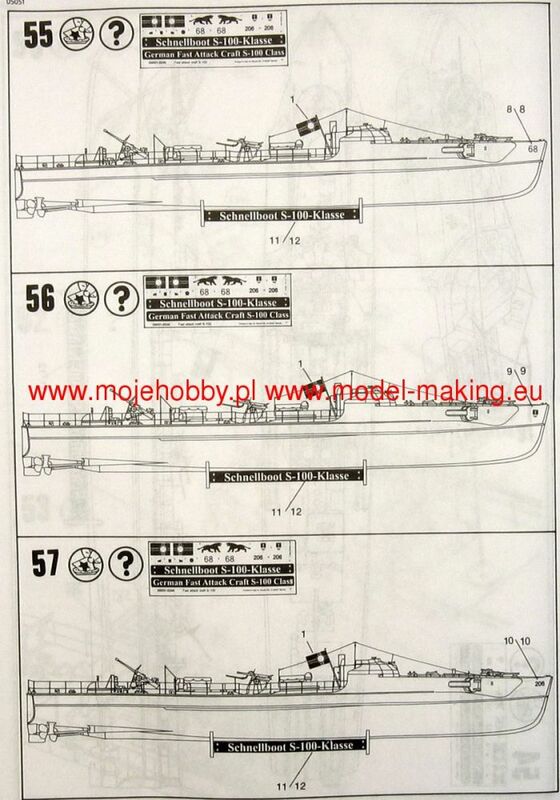 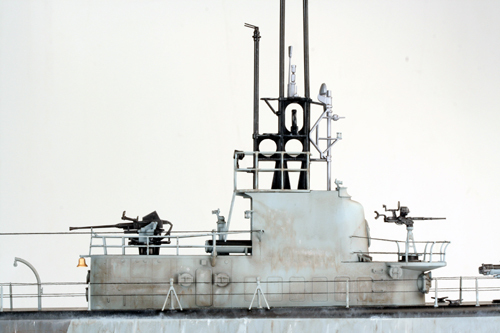 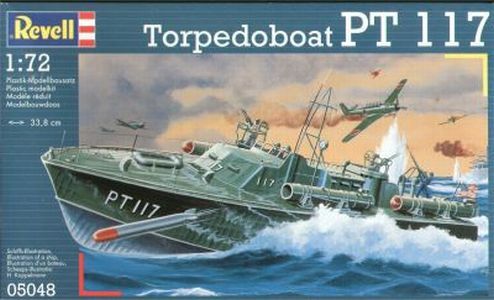 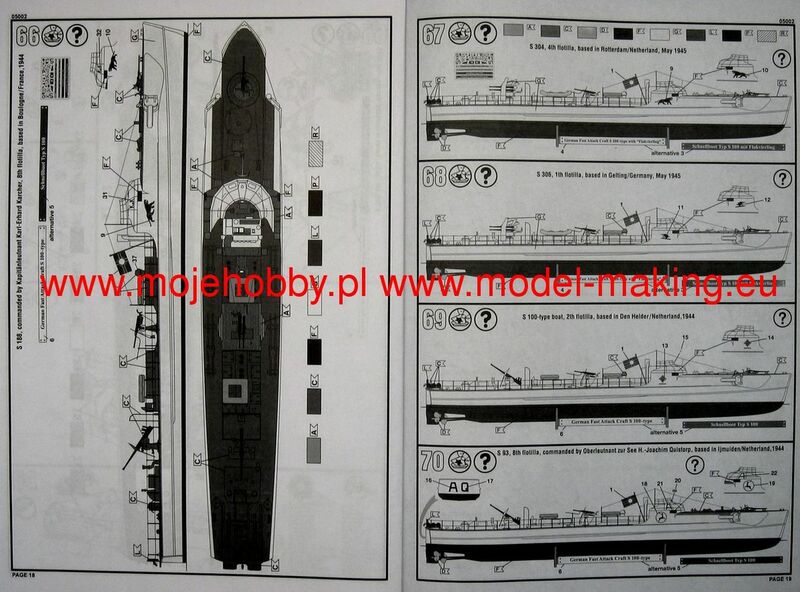 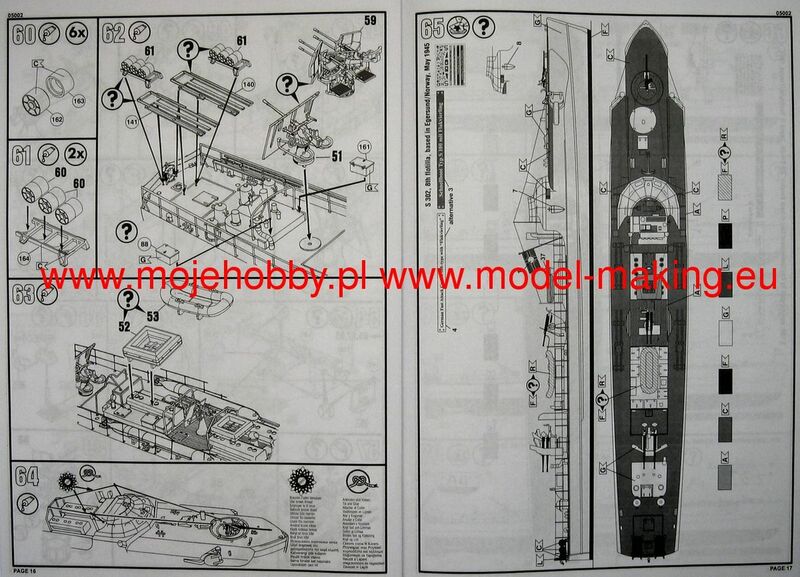 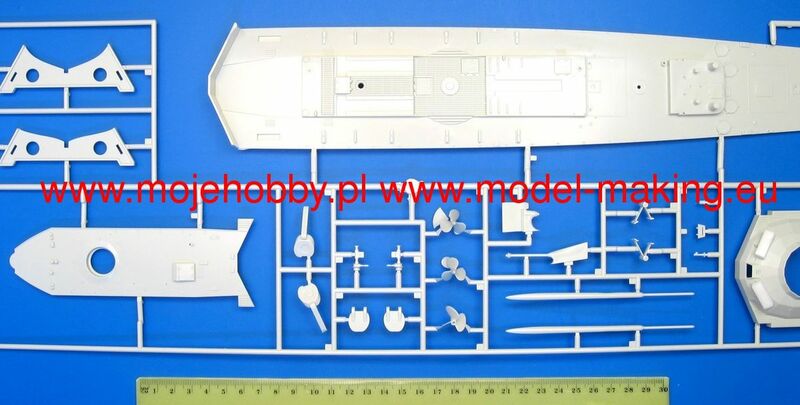 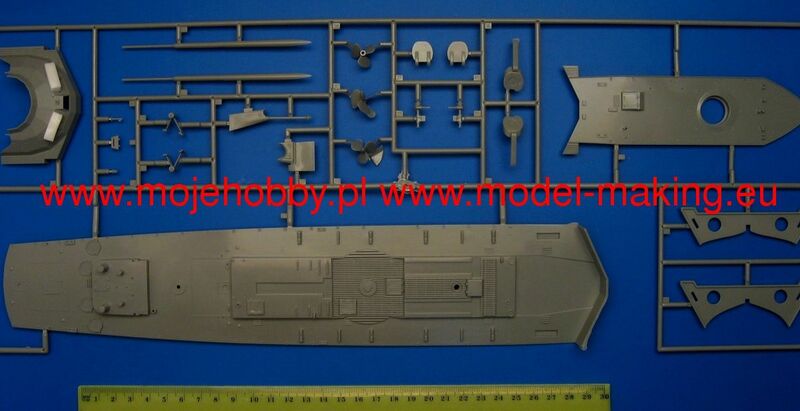 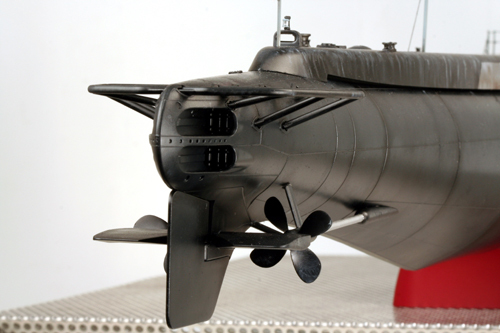 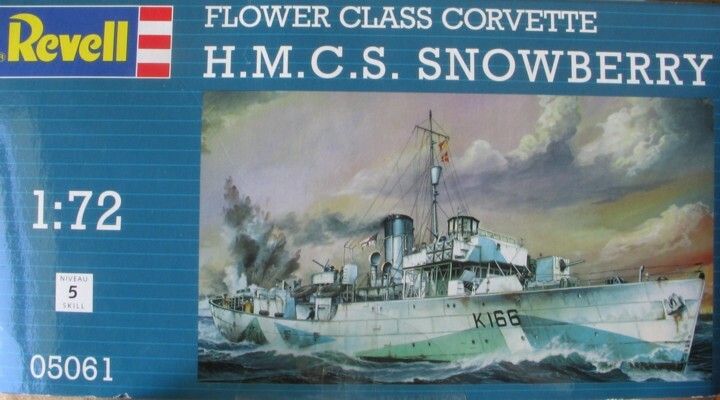 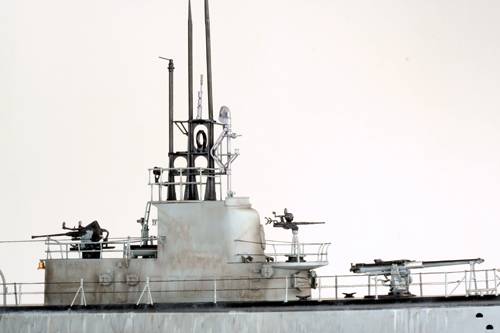 Kit 05015 - U-Boat VII-C "Die grauen Wolfe"
Kit 05061 - HCMS "Snowberry"
Revell has made the A4/V2 version in three different scales, 1/35, 1/54 and 1/69, the kits are "out of production"
The Revell 1/69 V2 rocket kit was first released beginning 1960 as a Revell junior kit, which was only bagged. 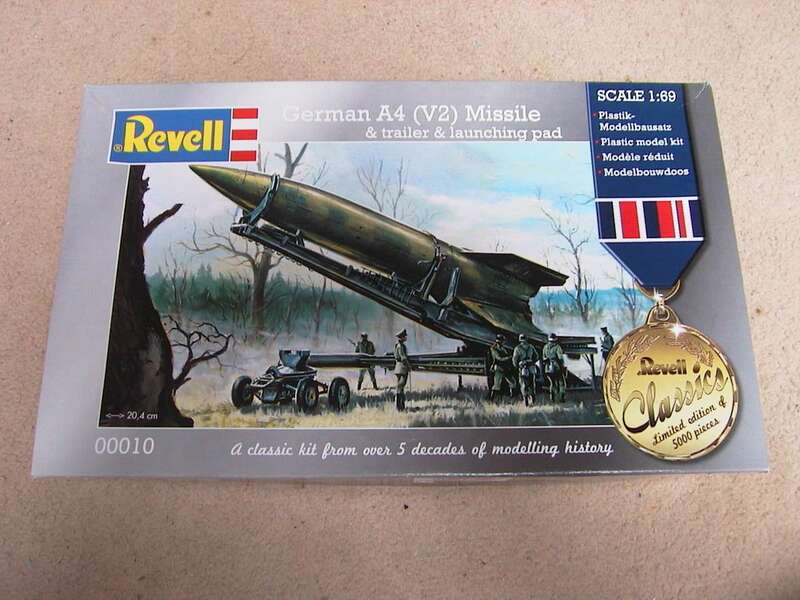 The true scale of this kit is up for debate but I will stick with the official scale stated by Revell. 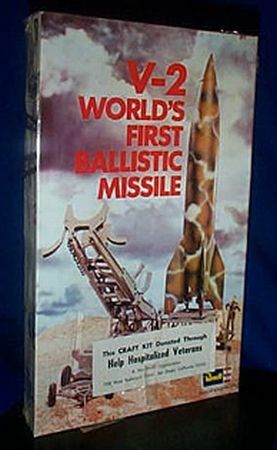 Not much is known about this first release. 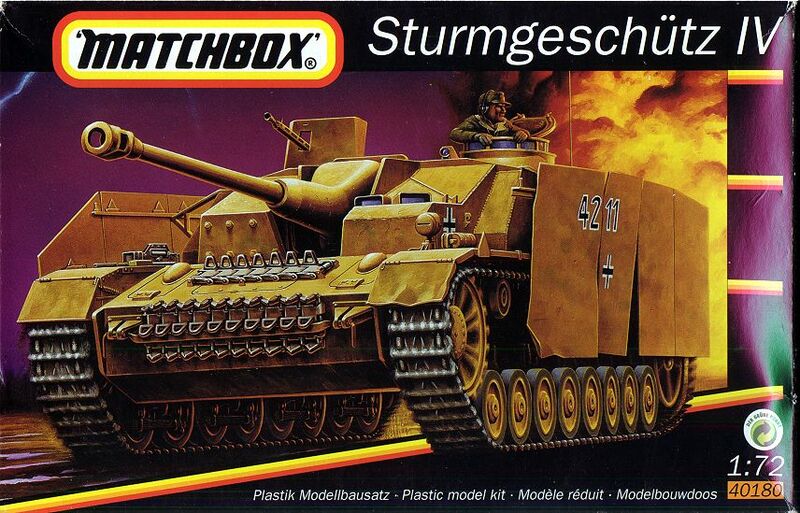 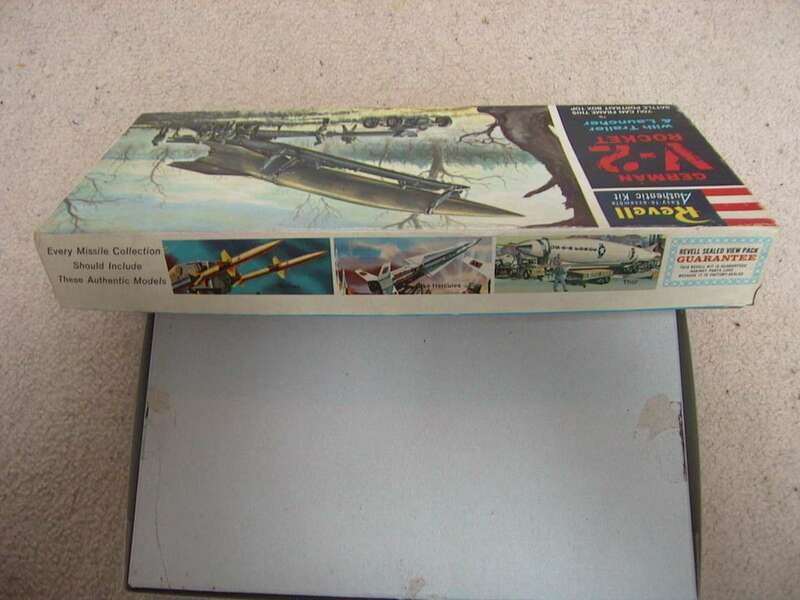 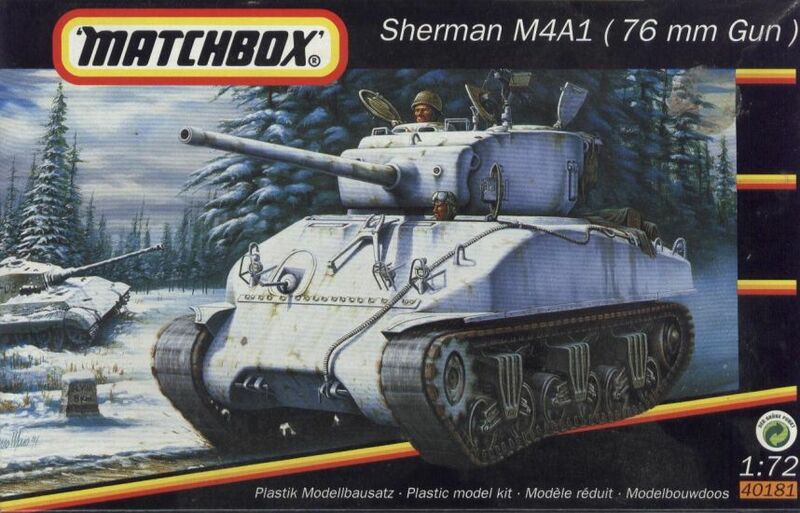 The second release was packed in the famous "H" series two piece sturdy glued boxes with the John Steel boxart so beloved by many vintage kit-lovers. 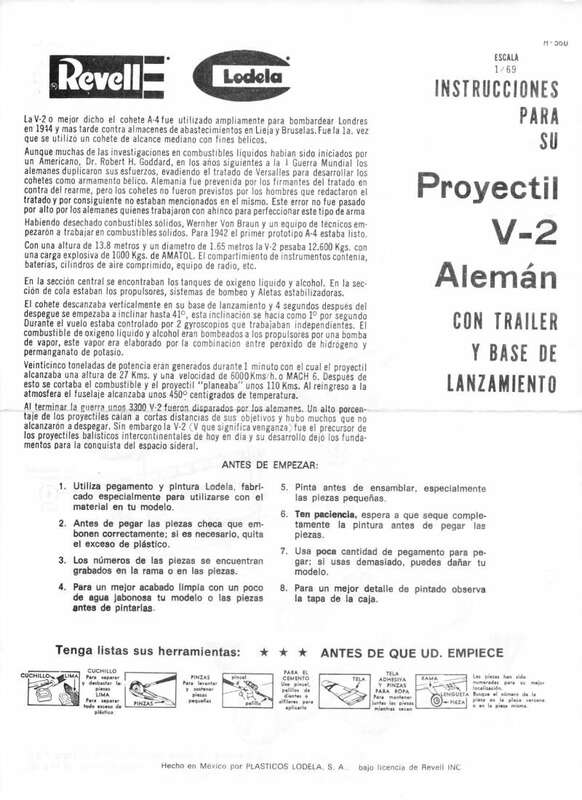 The contents of this release were in three different colors : green, black and silver. 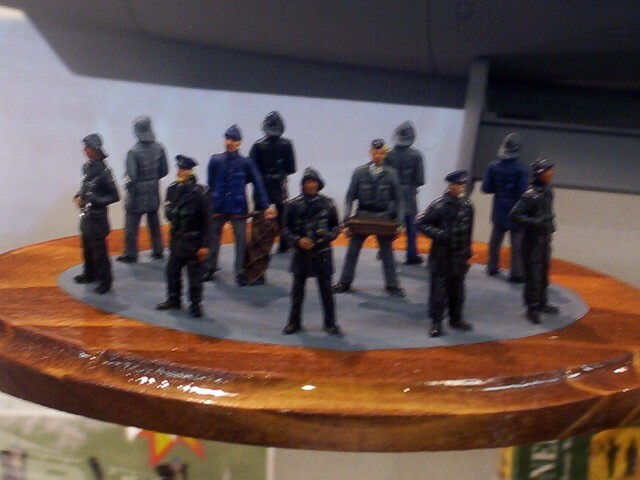 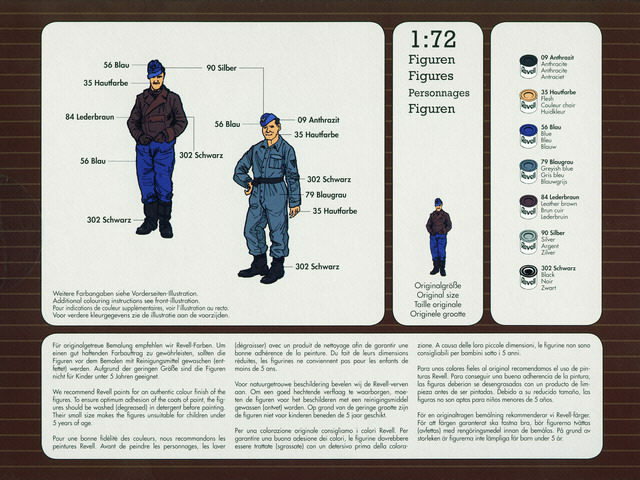 Kitnumber was H-1830. 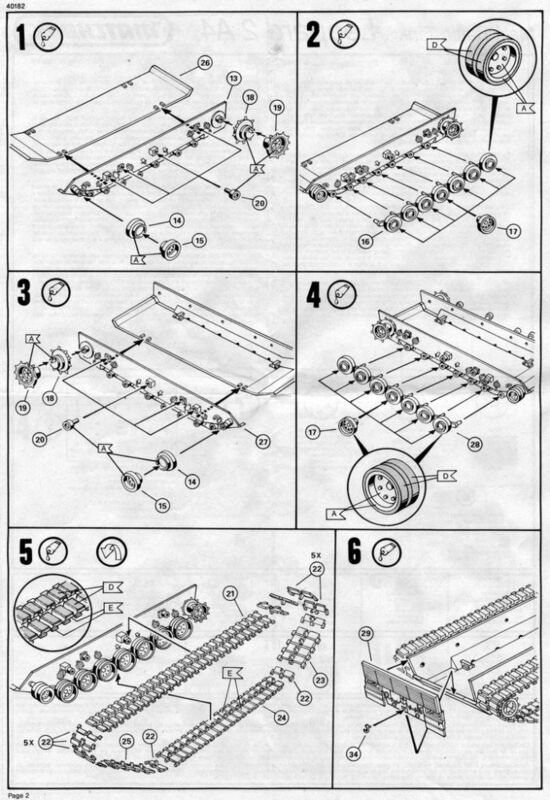 On the lower work platform part no. 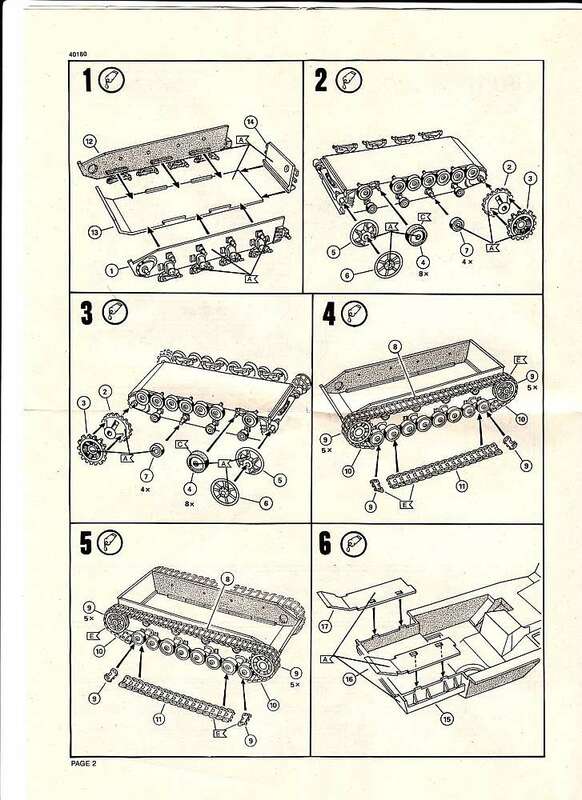 40 of the Meiller Wagen the production date 1962 is stamped, but on the instructions the date is 1960. 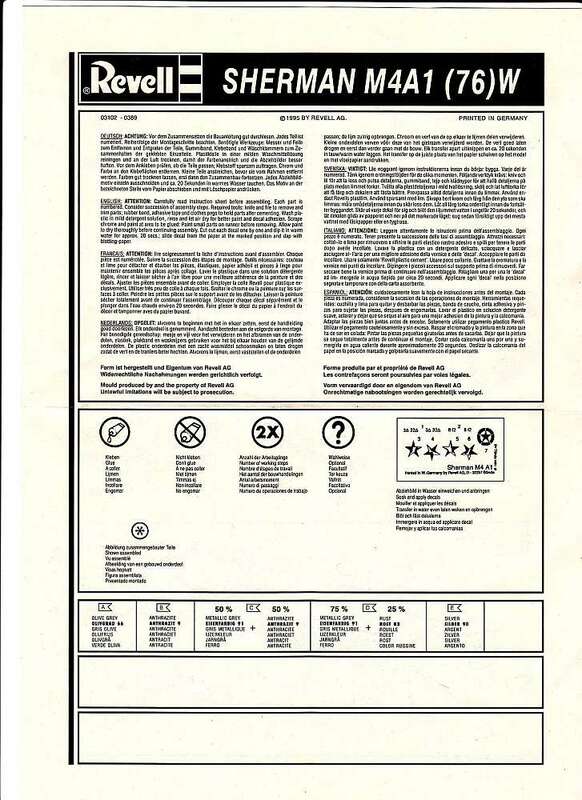 Later issues also have other production dates stamped on this same part. 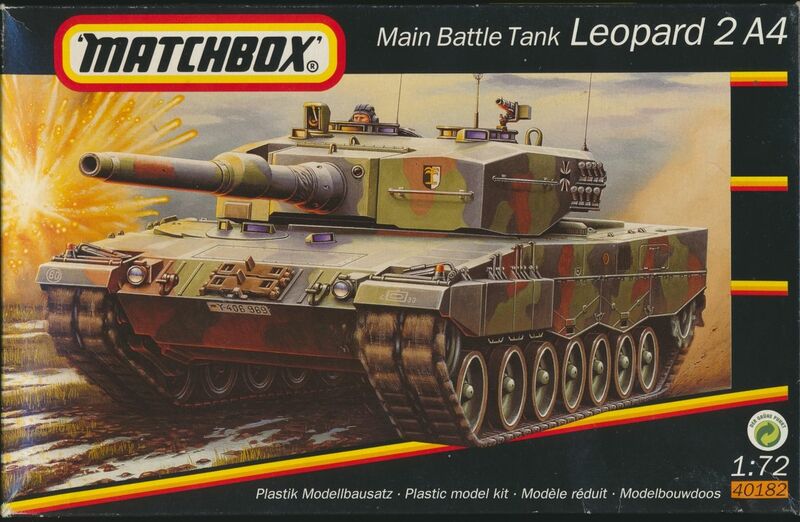 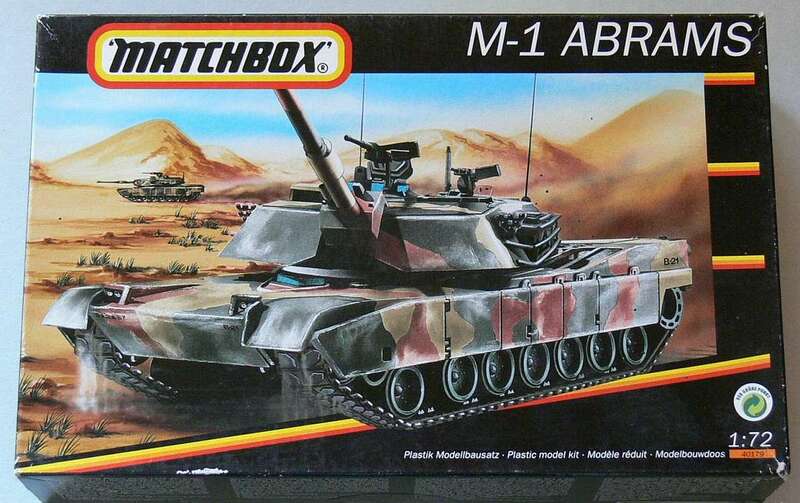 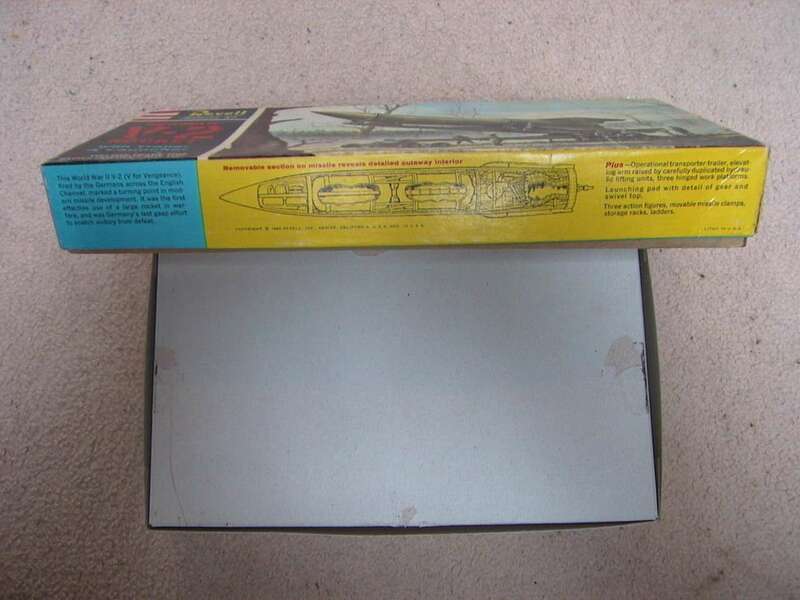 More releases followed through the years with various boxart and also the impopular painted model picture on the boxtop. 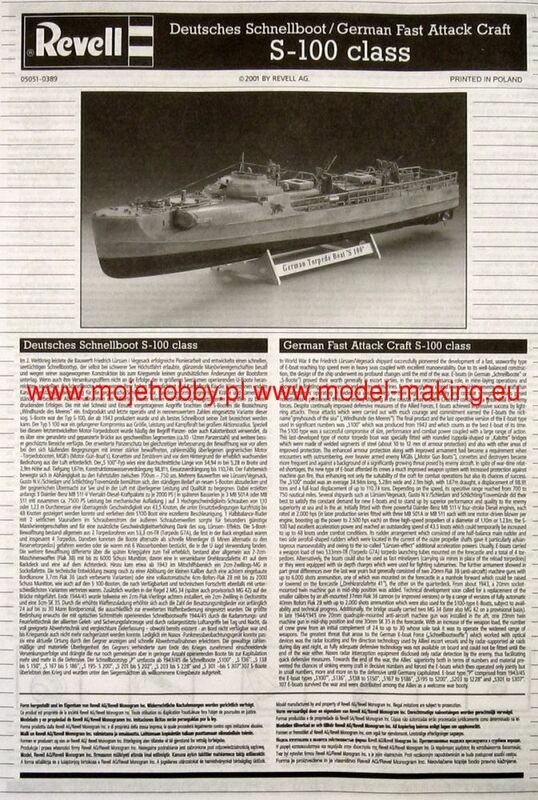 Somewere around 1985 a "History Makers" isue was released. 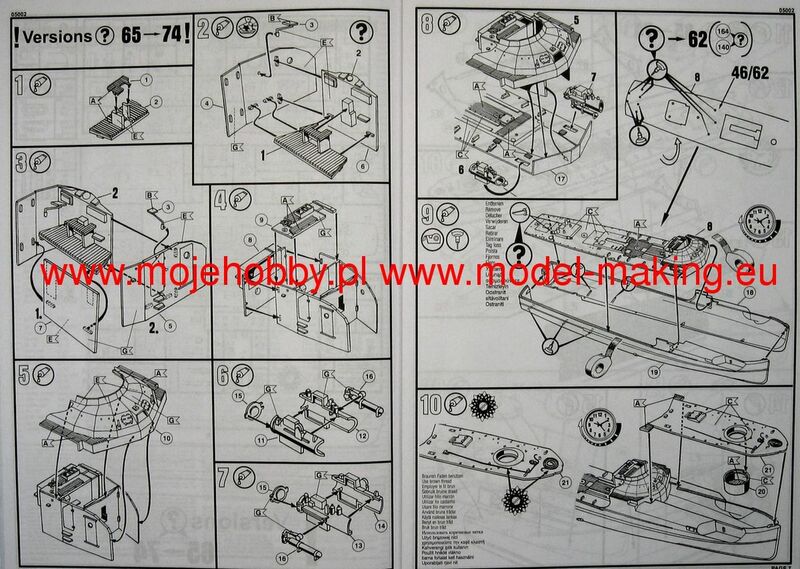 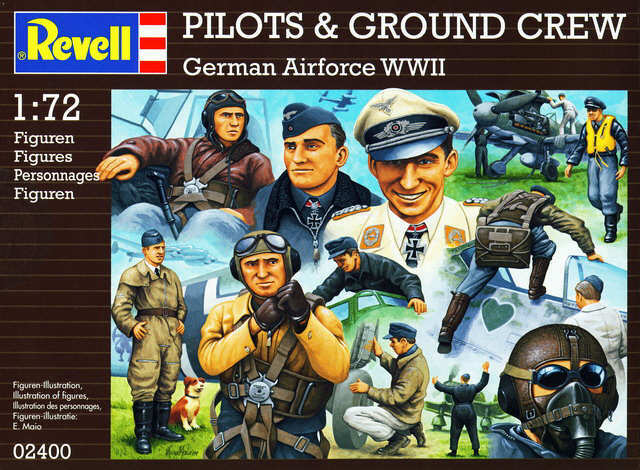 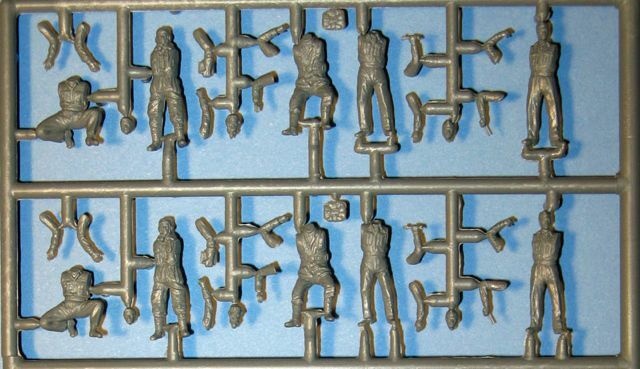 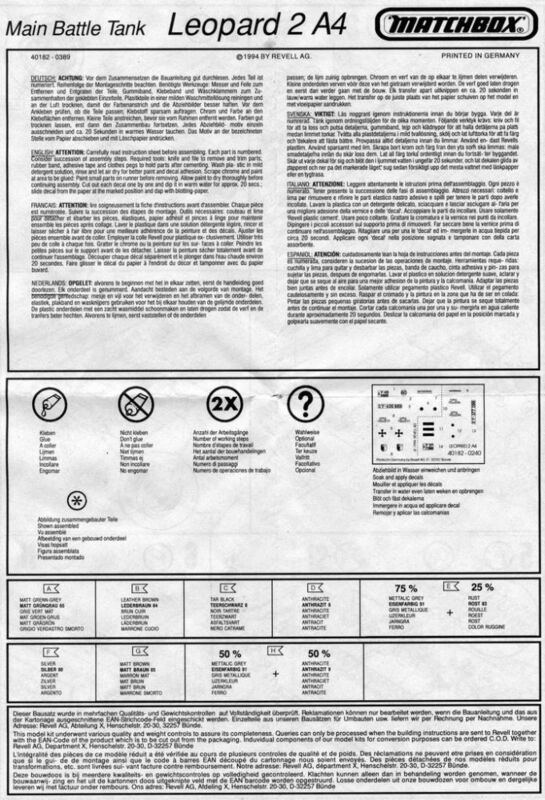 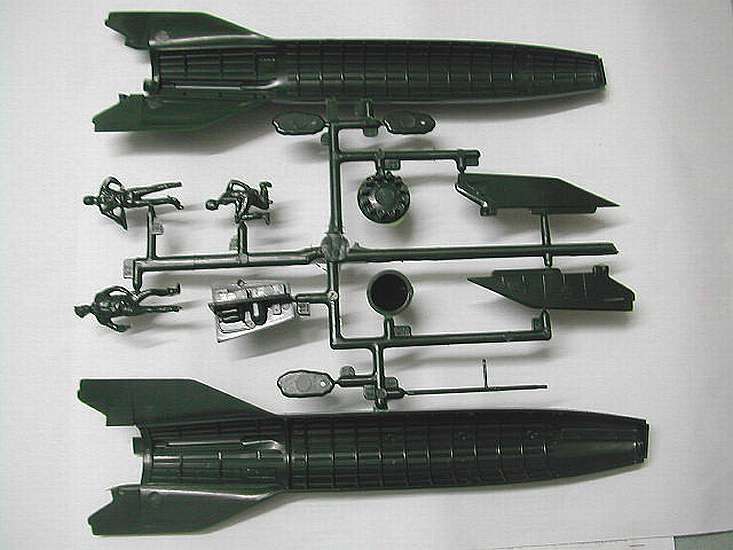 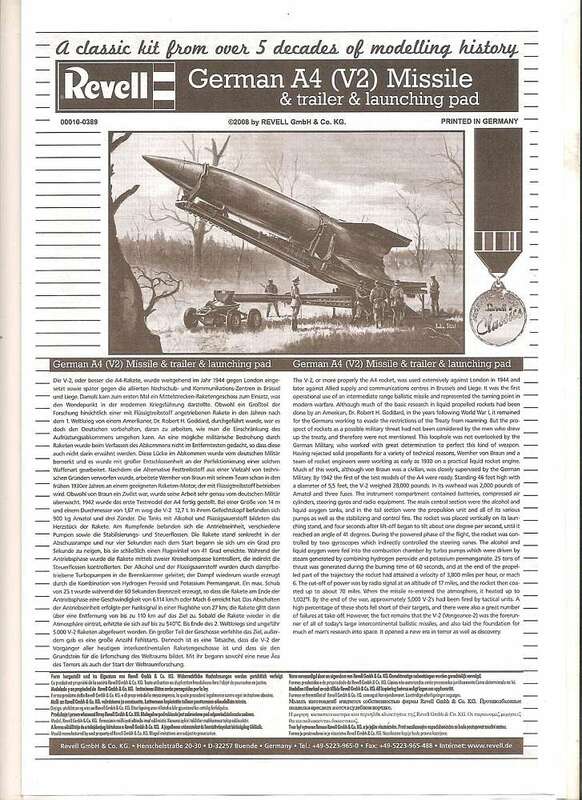 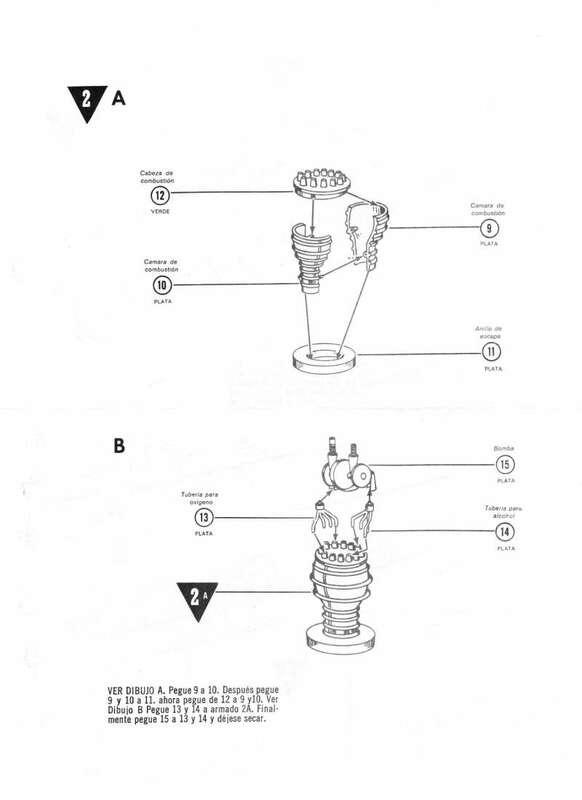 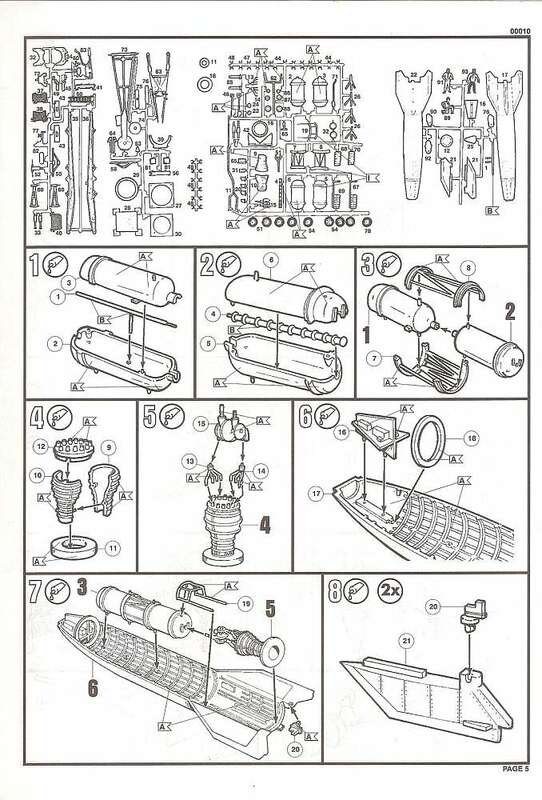 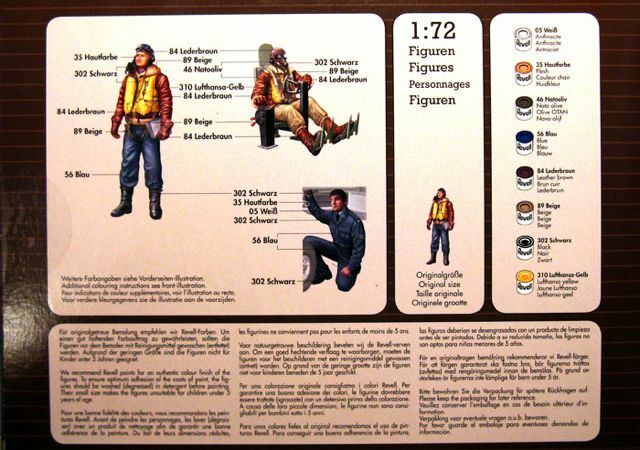 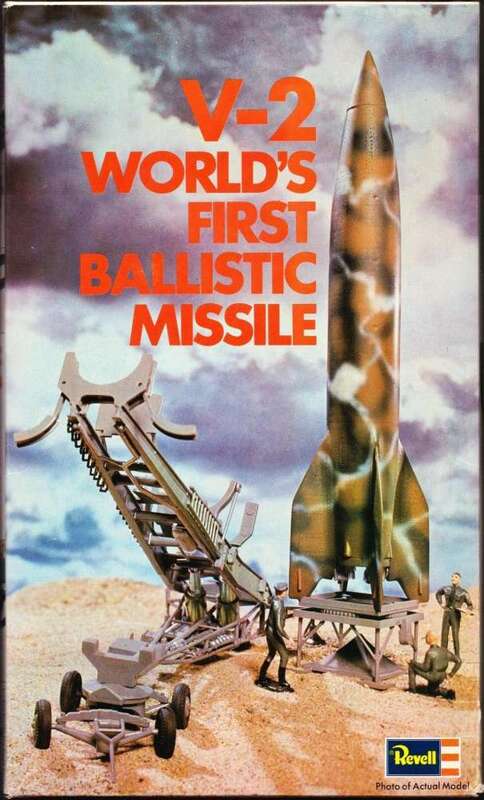 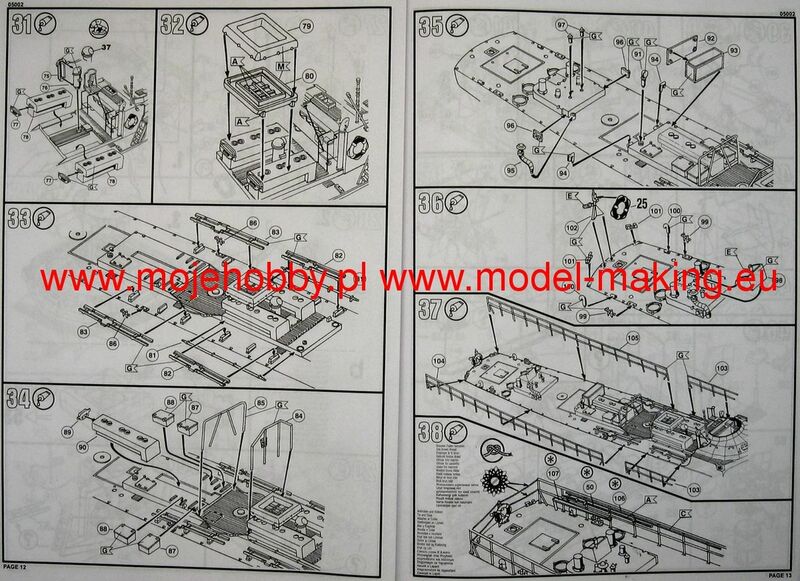 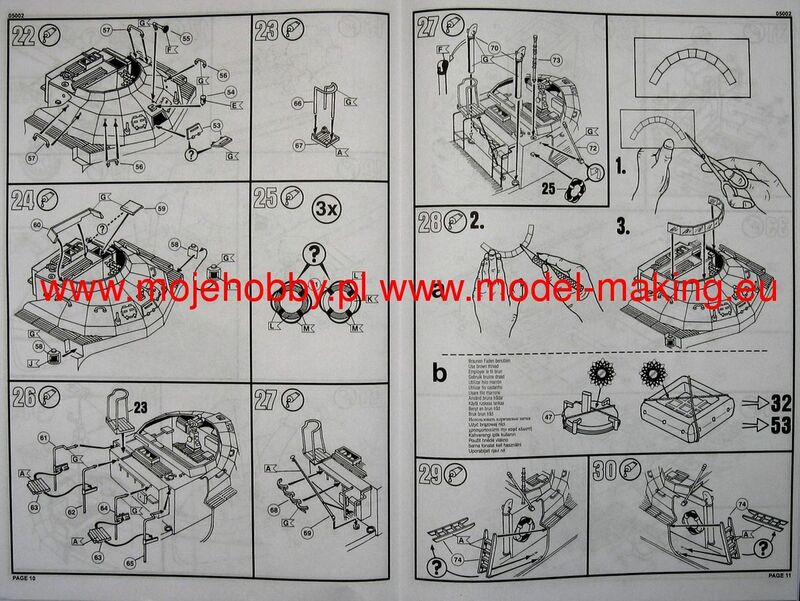 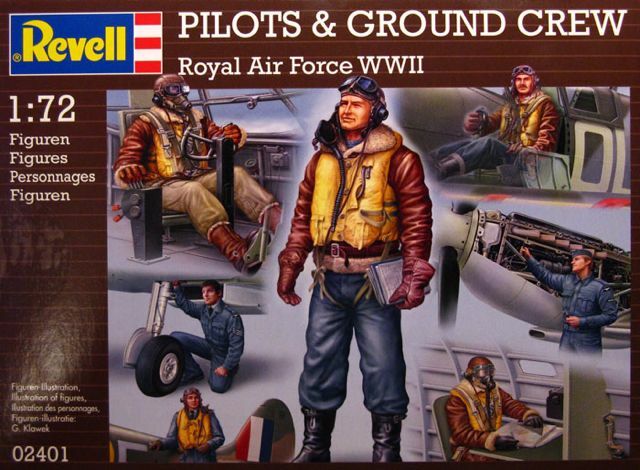 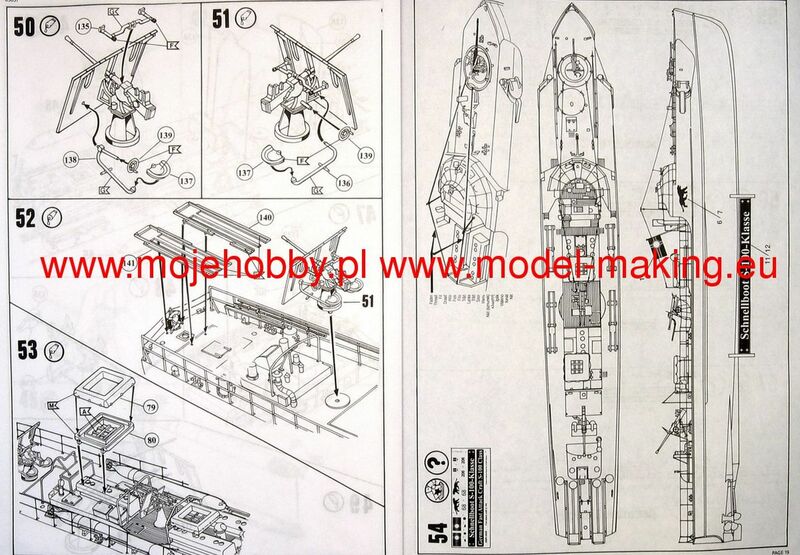 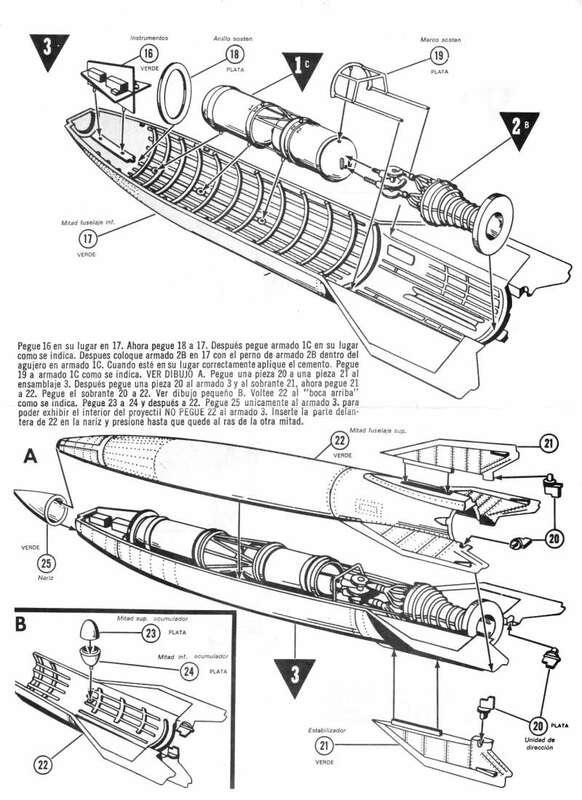 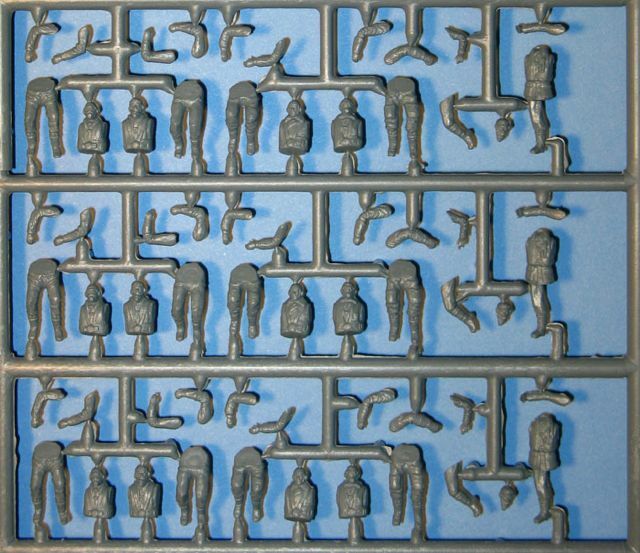 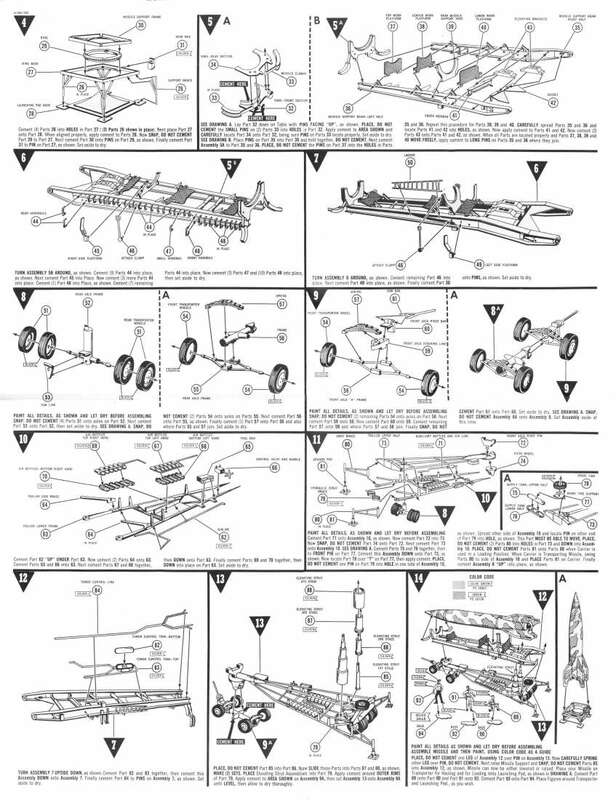 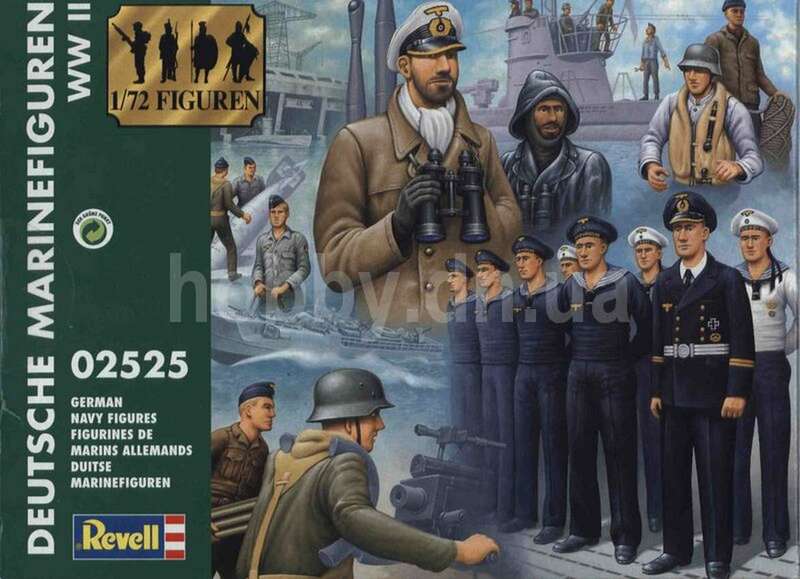 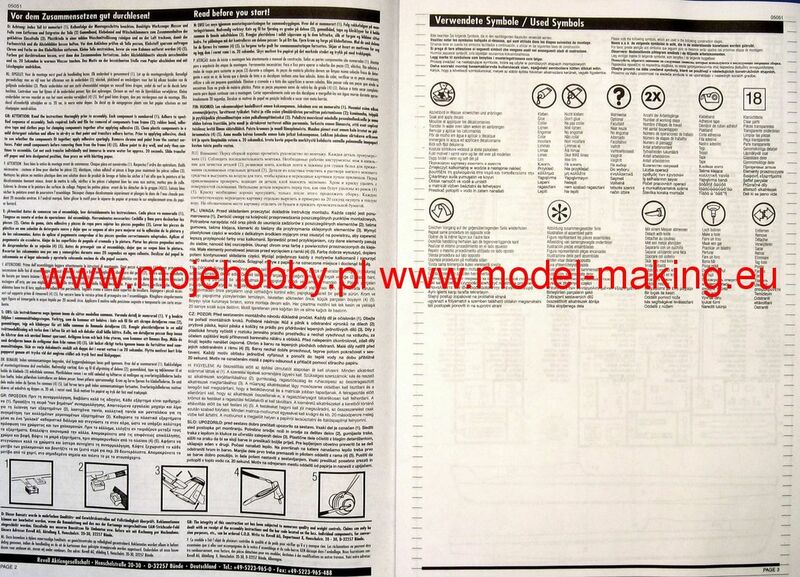 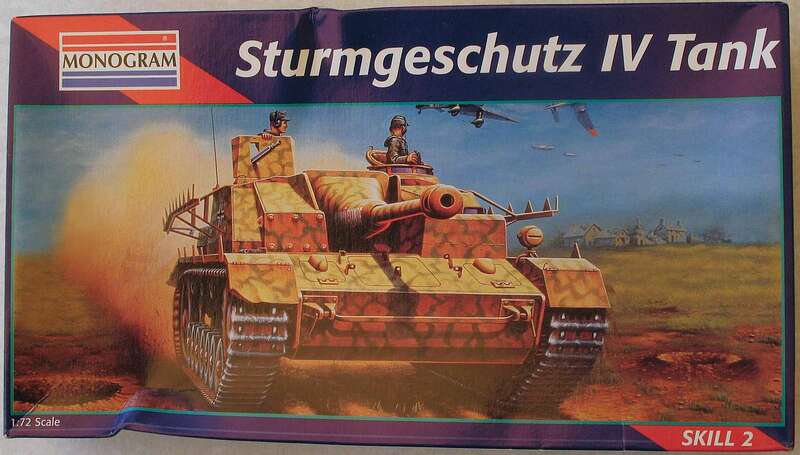 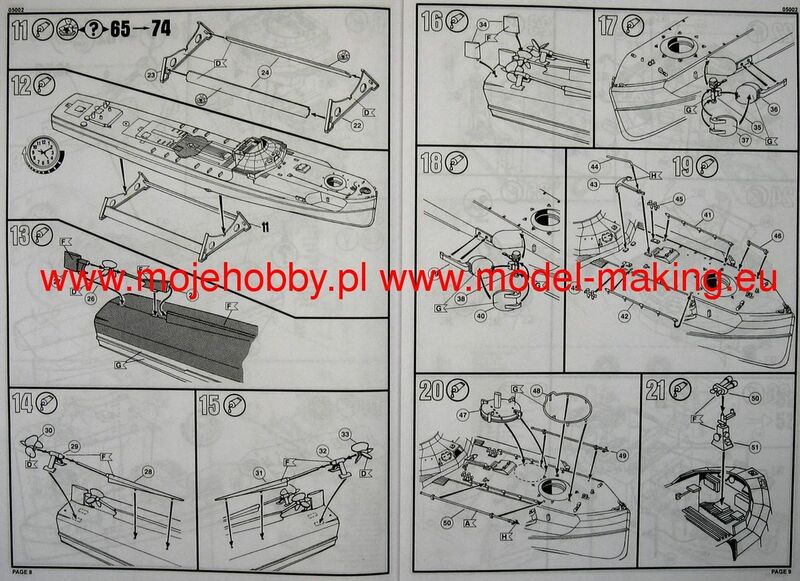 See also the part on these pages about the Revell KIKO and LODELA releases. 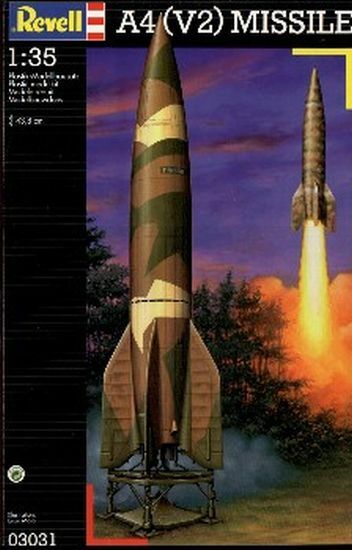 The 1994 issue I own again has a "H" number on a larger two part box- again with a copy of the John Steel artwork. 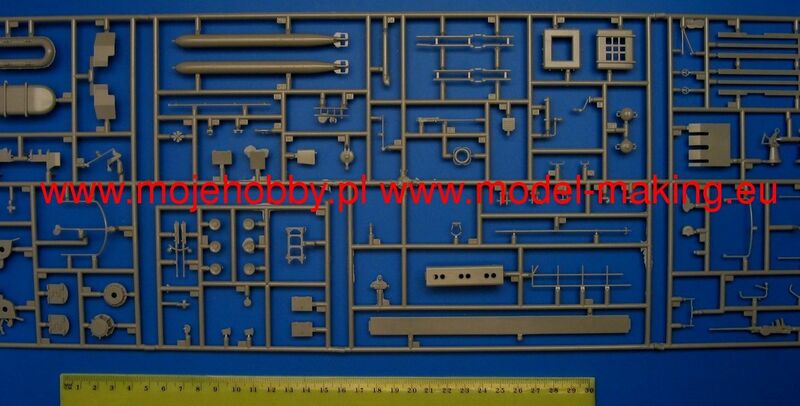 Kitnumber is H-560-0139. 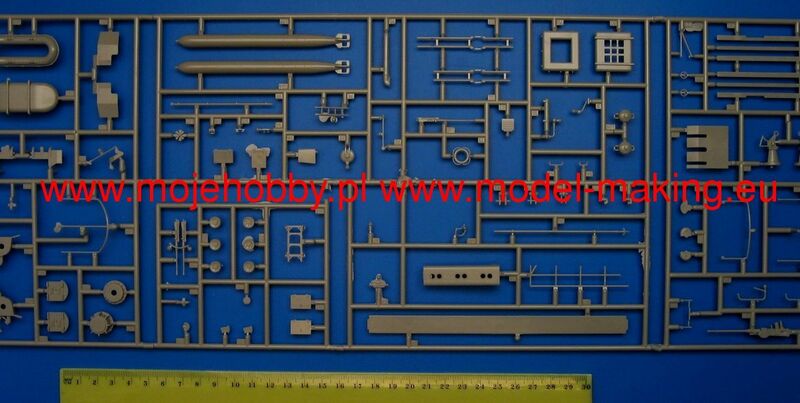 It has production mould date 1982 on the platform part. 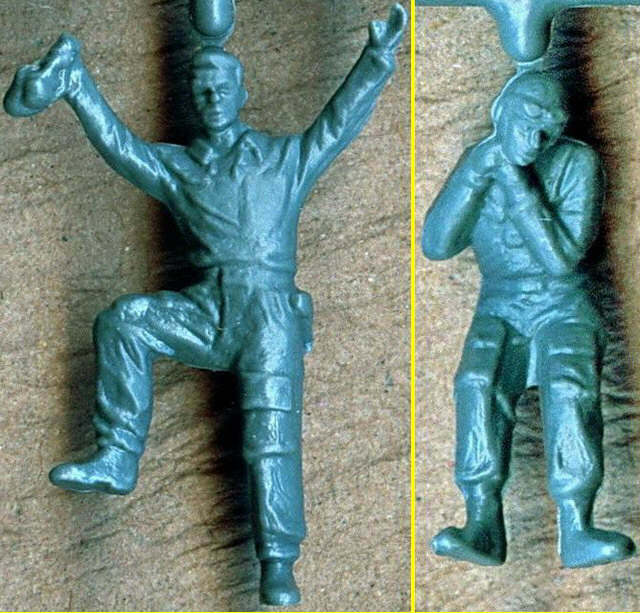 The plastic is light grey. 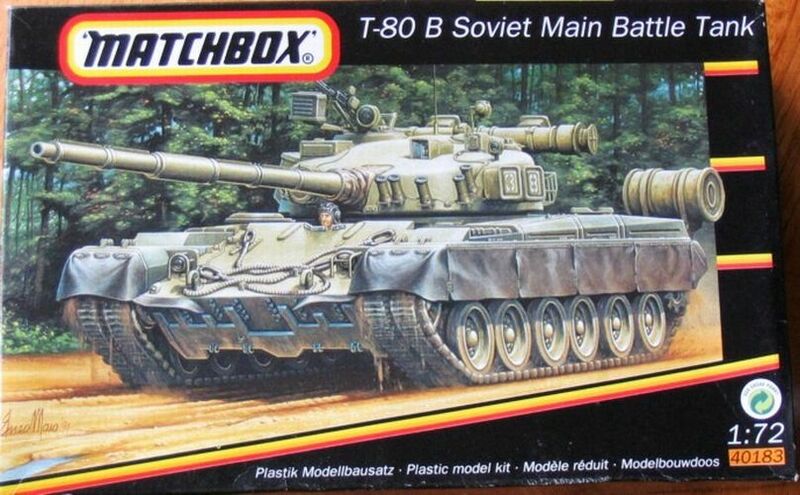 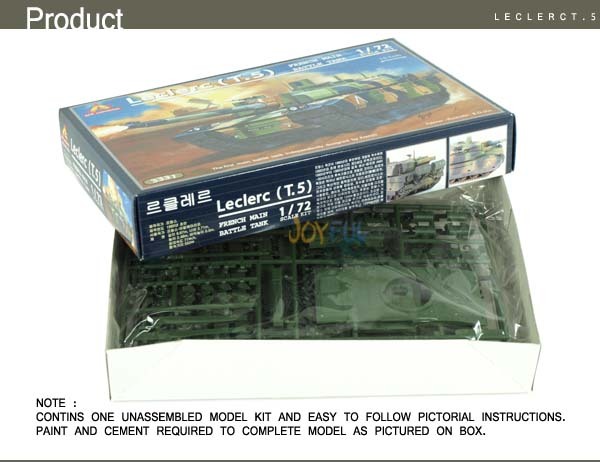 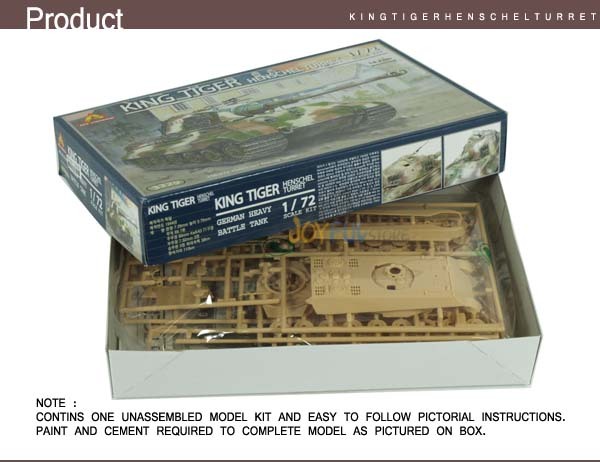 Kit H-560-0139 - release 1994 ? 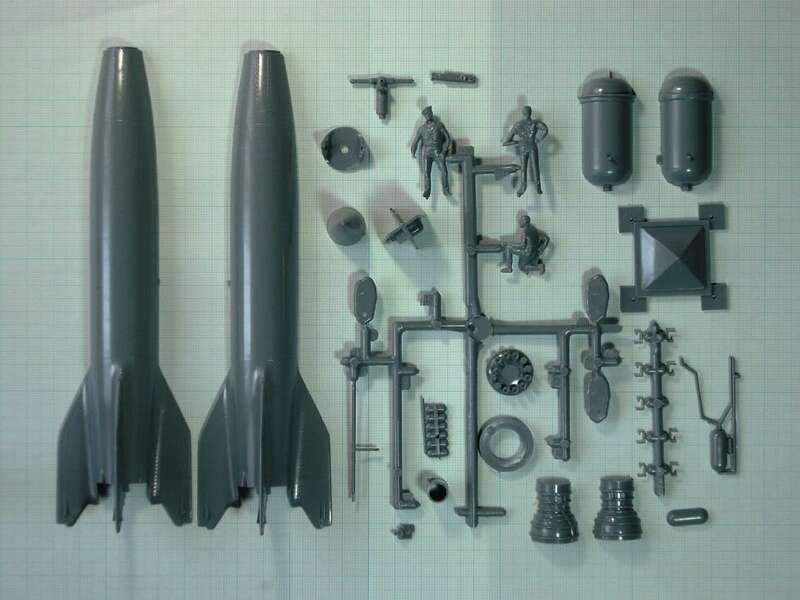 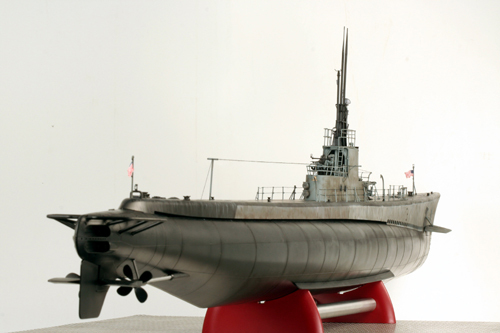 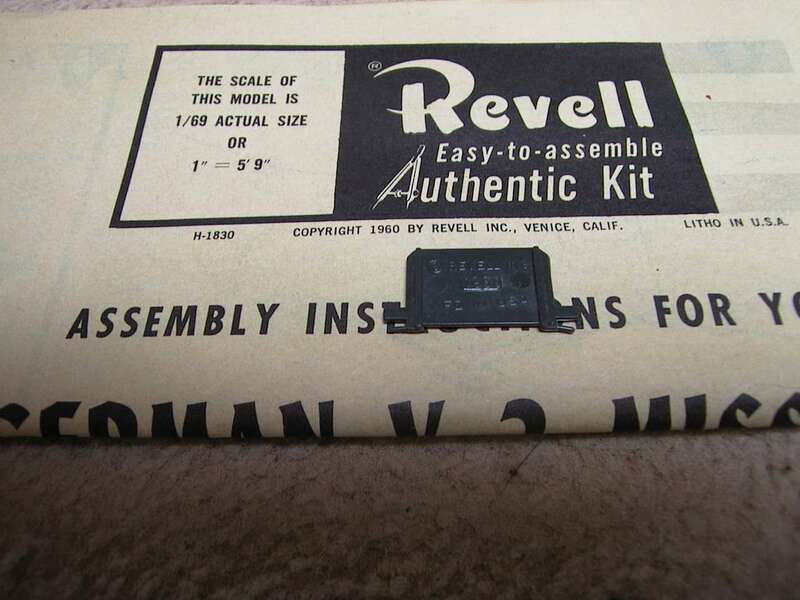 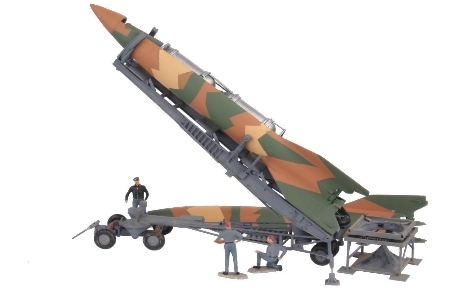 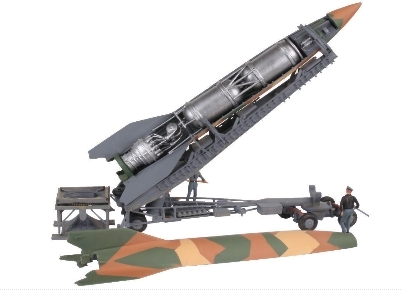 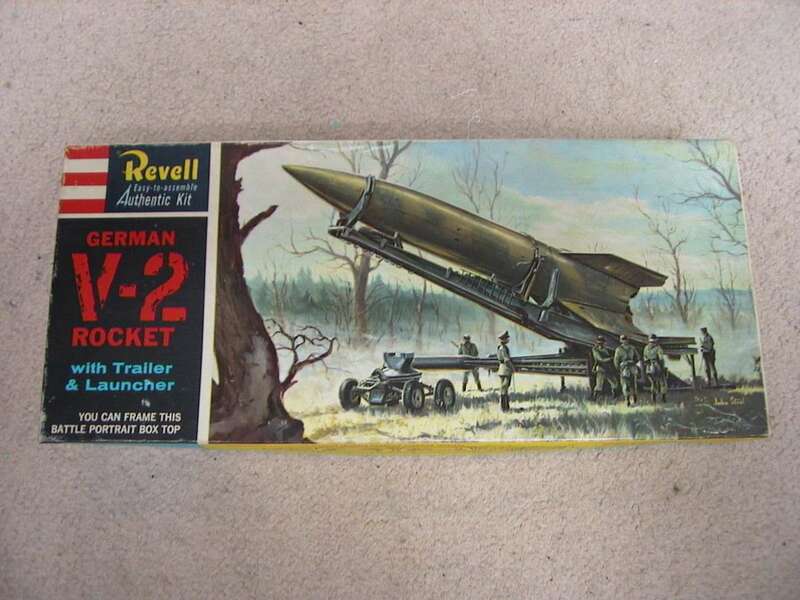 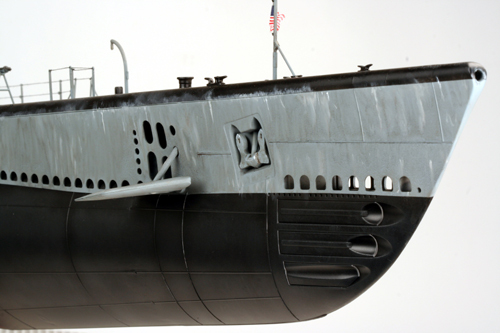 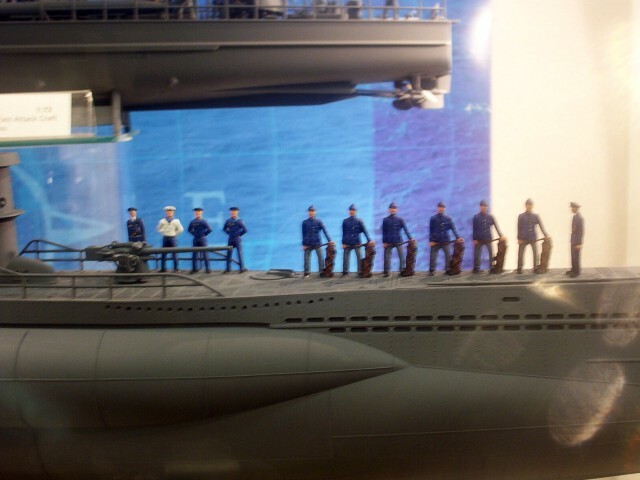 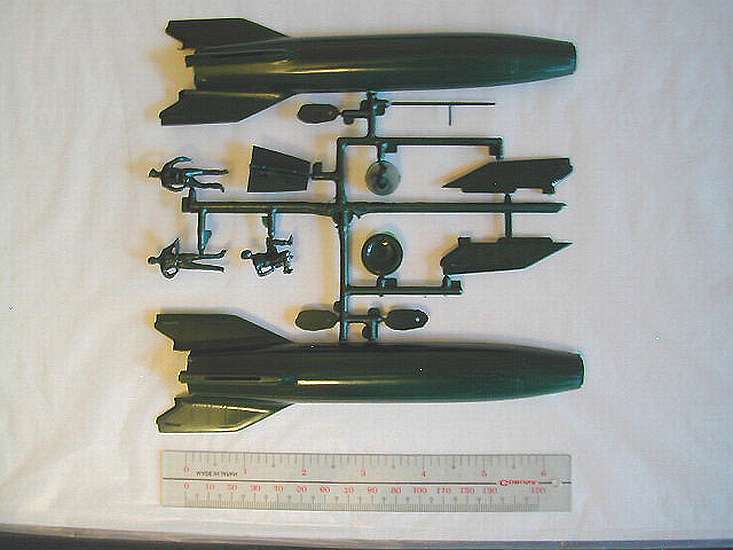 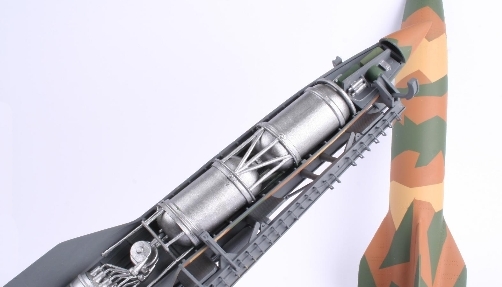 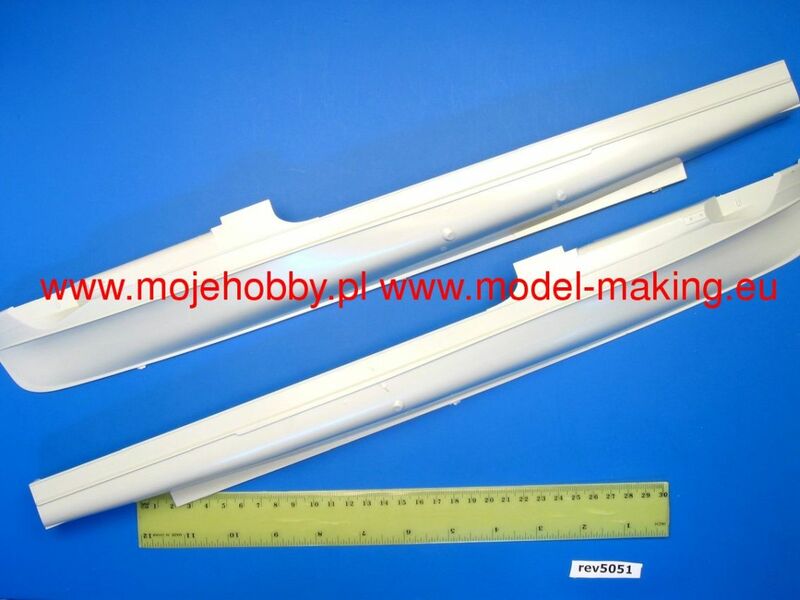 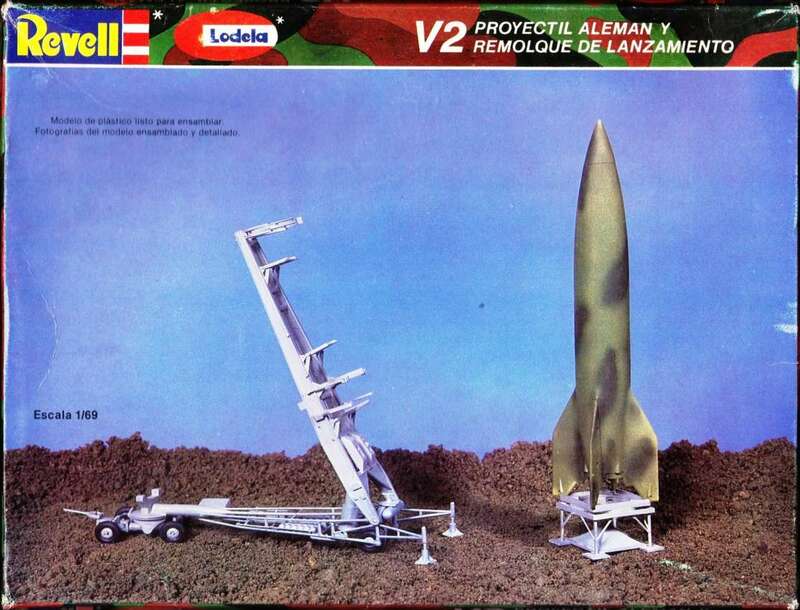 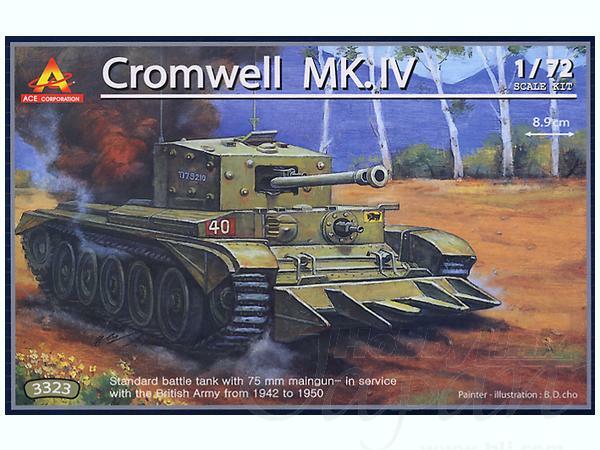 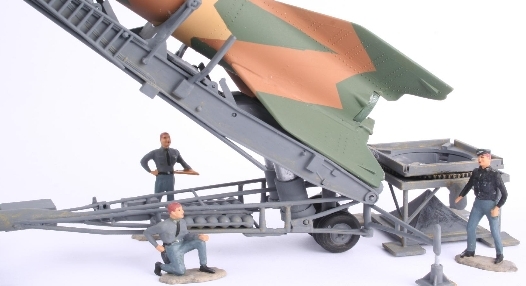 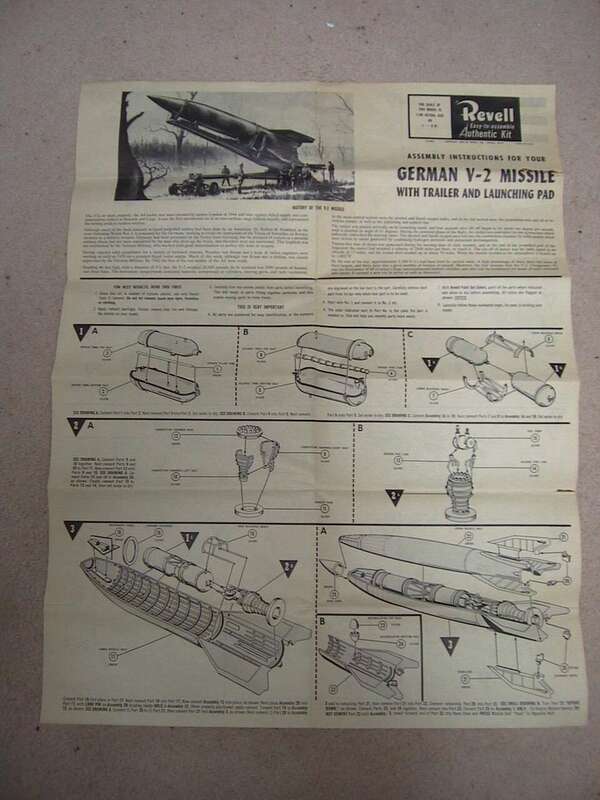 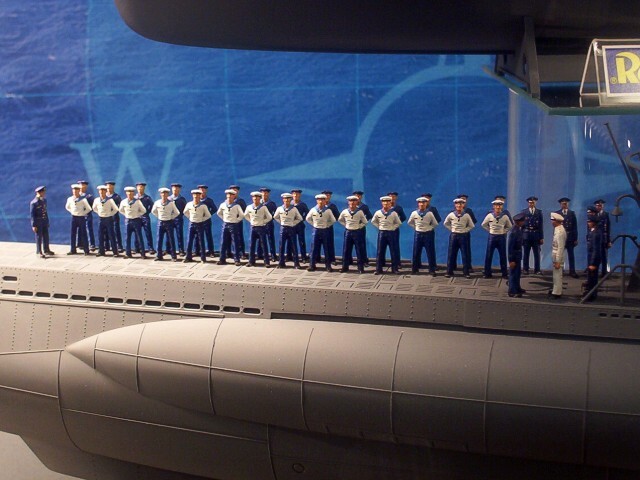 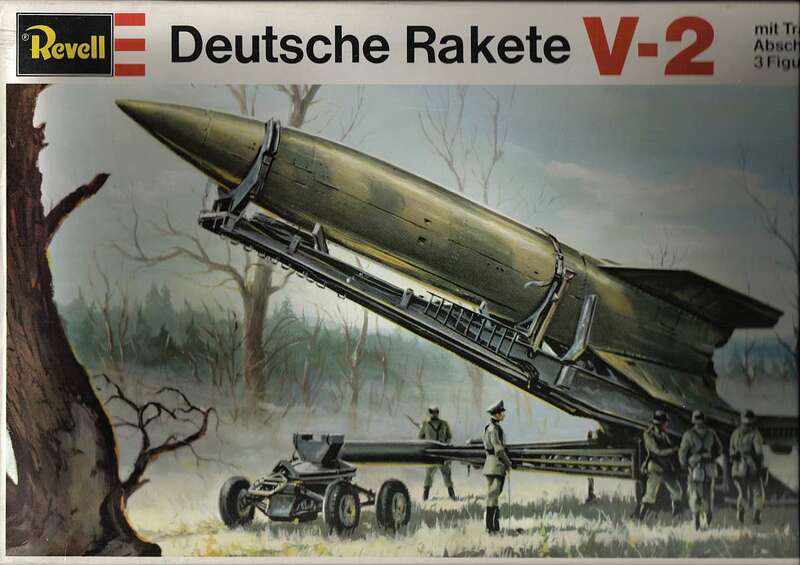 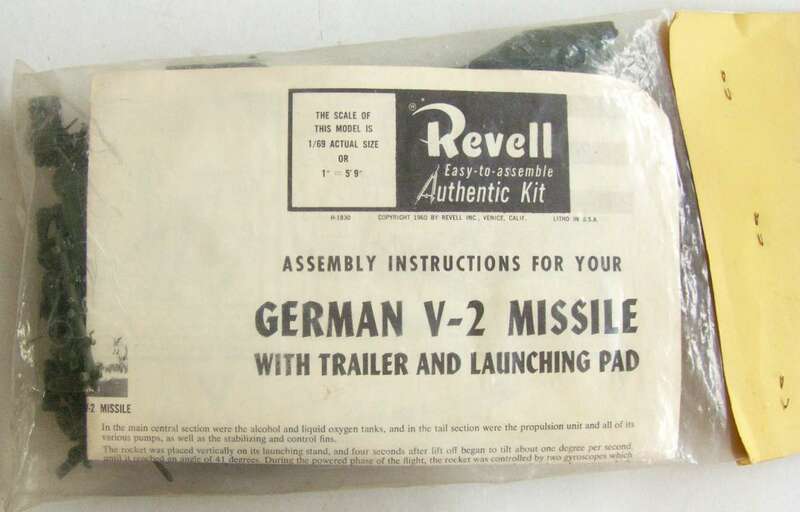 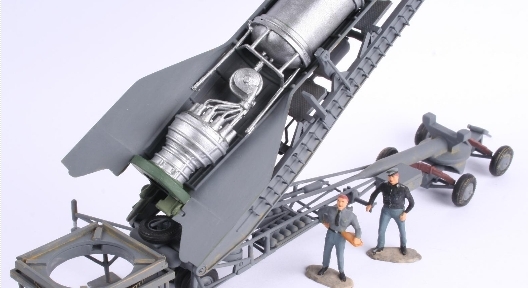 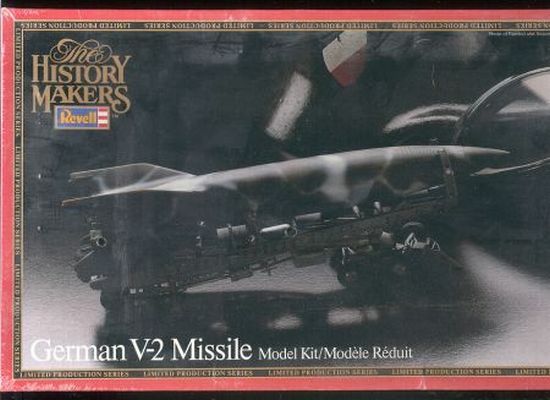 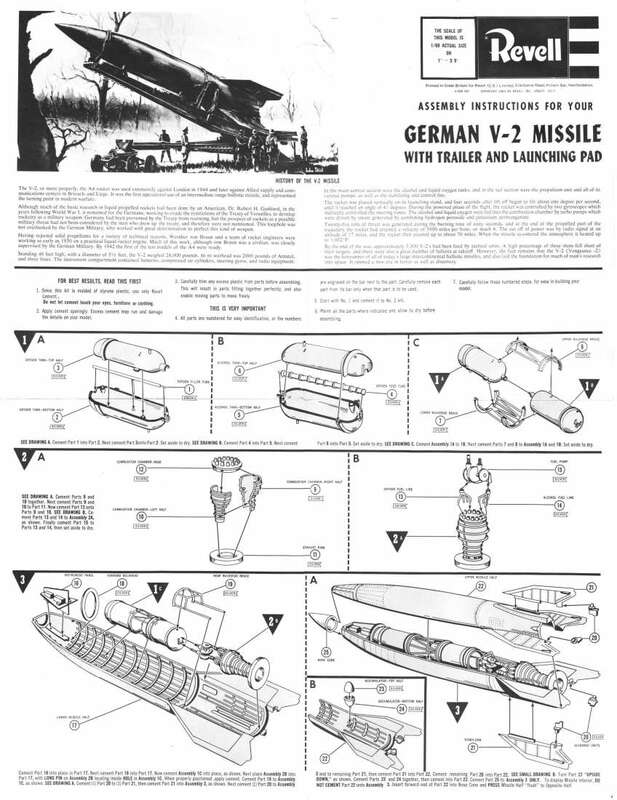 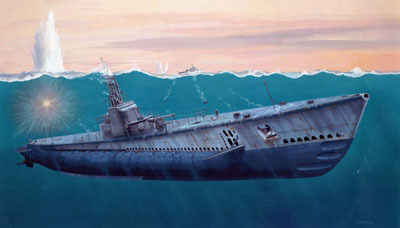 The 1/69 scale Revell V2 length is 20.4cm. 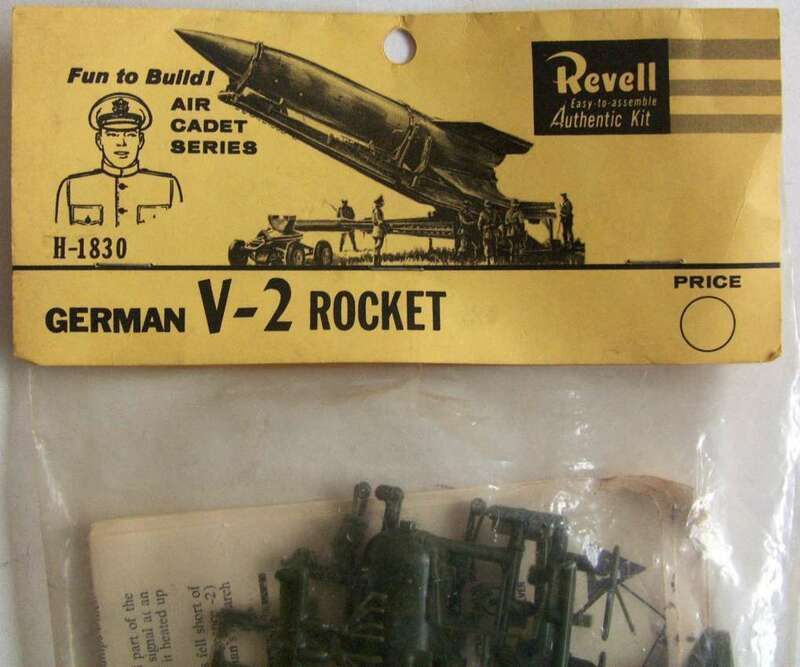 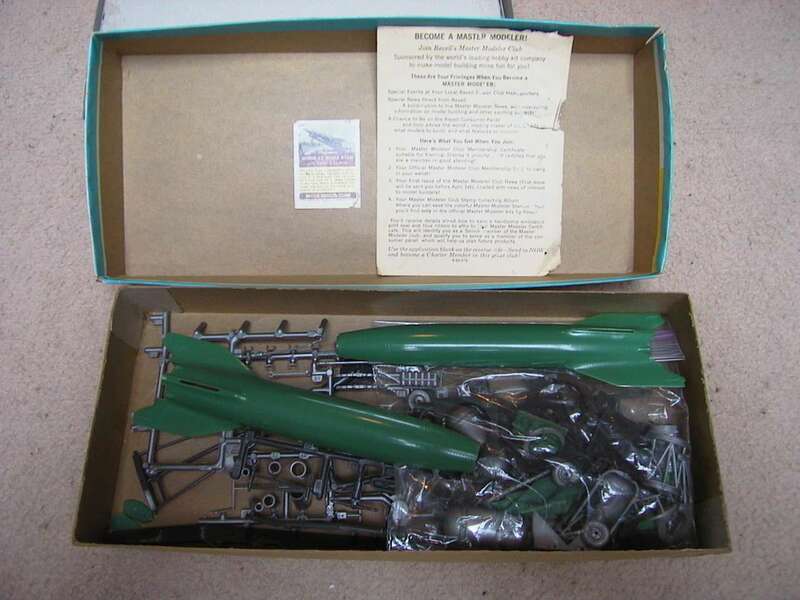 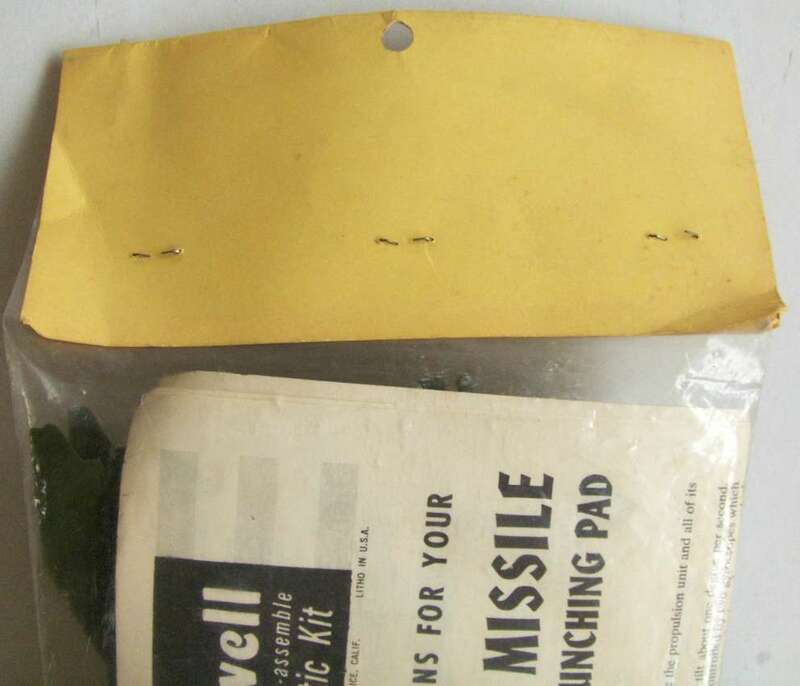 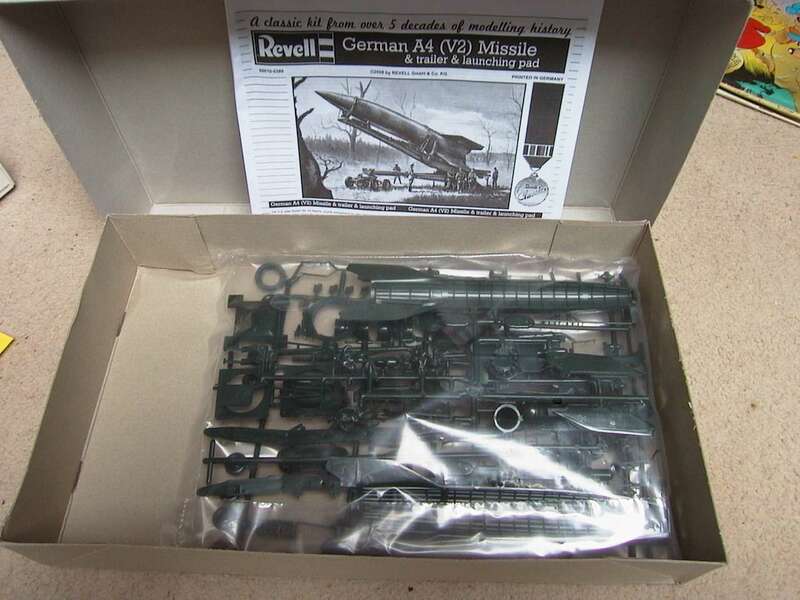 MR. A. KIKOLER (KIKO) took REVELL to BRASIL in circa 1960 and all (hundreds) of Revell kits produced worldwide are also produced in Brasil, even with similar boxtops. 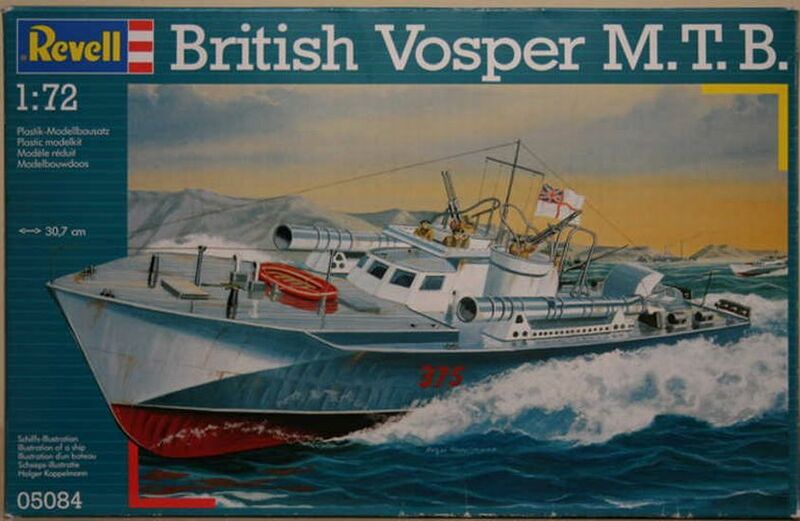 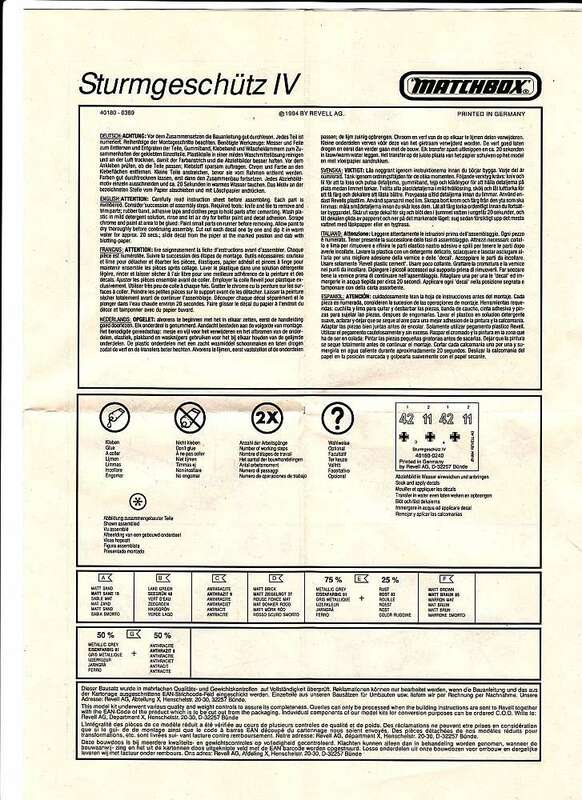 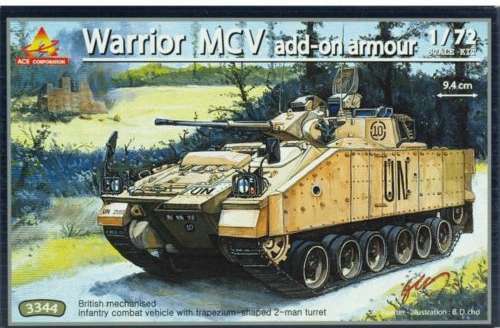 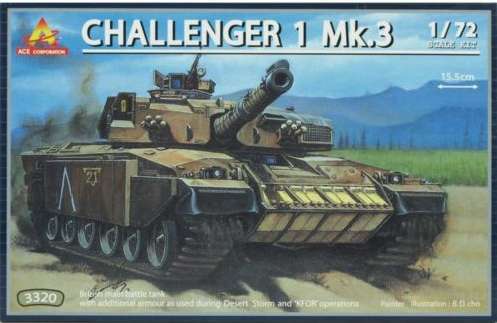 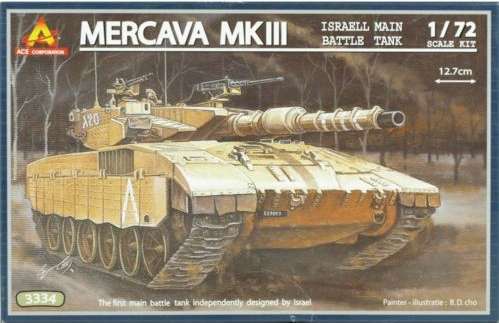 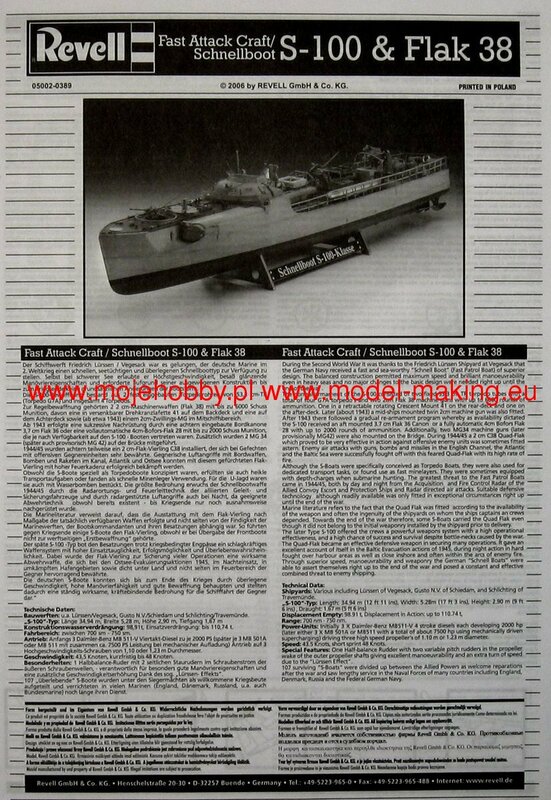 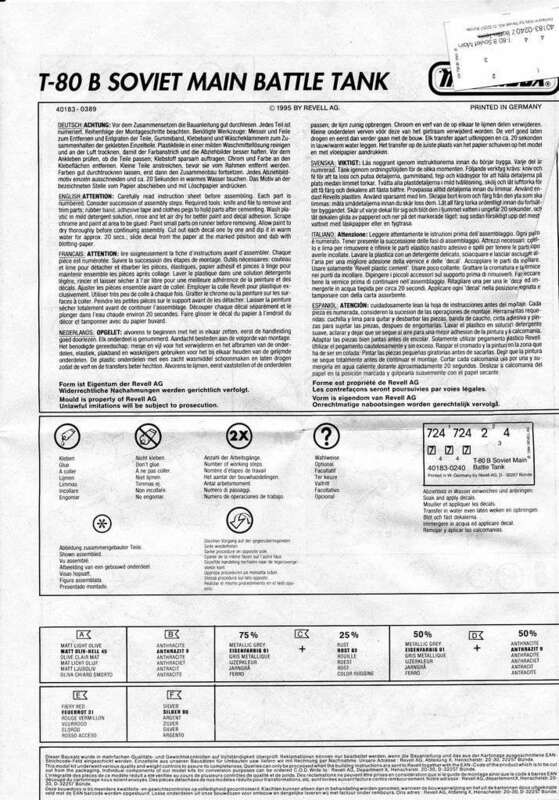 From circa 1980 the KIKO brandname was added becoming REVELL KIKO and afterwards also HELLER KIKO (some 20 kits only) and AIRFIX KIKO (just 18 kits only). 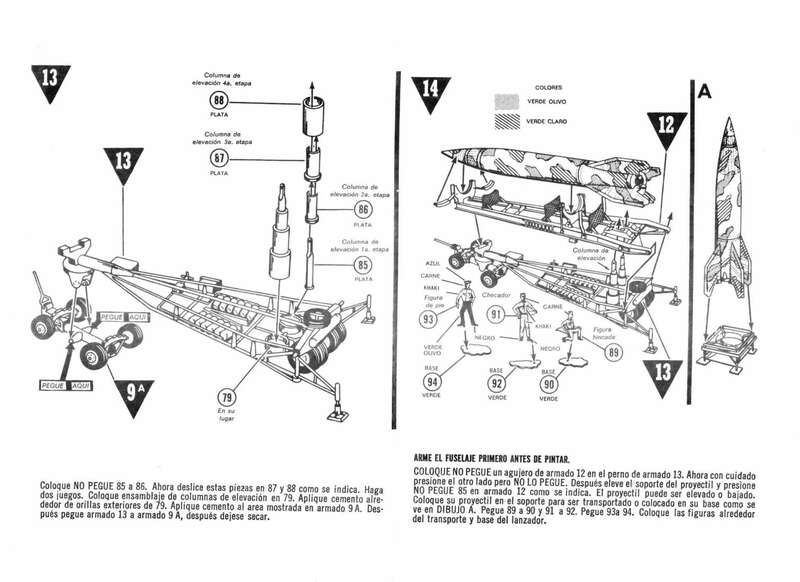 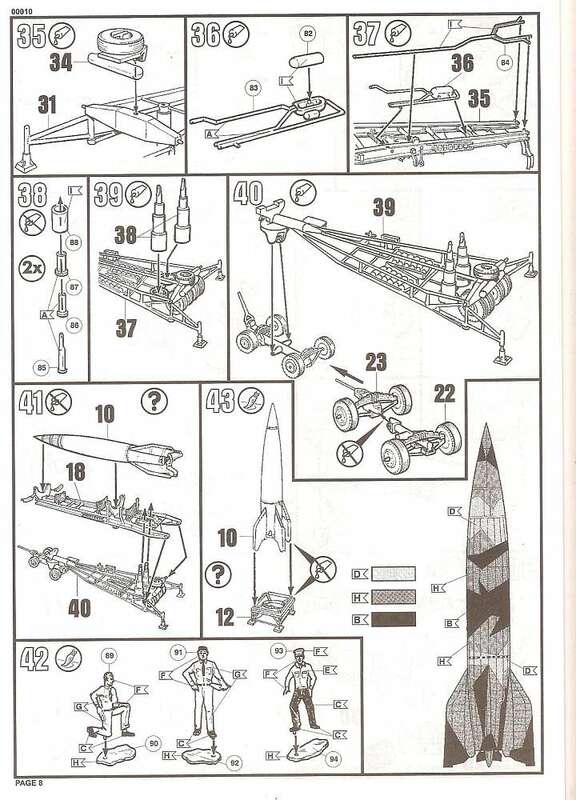 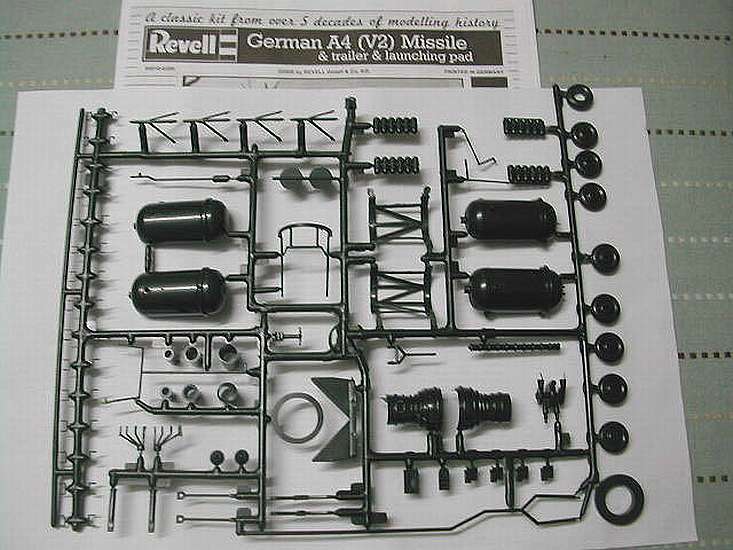 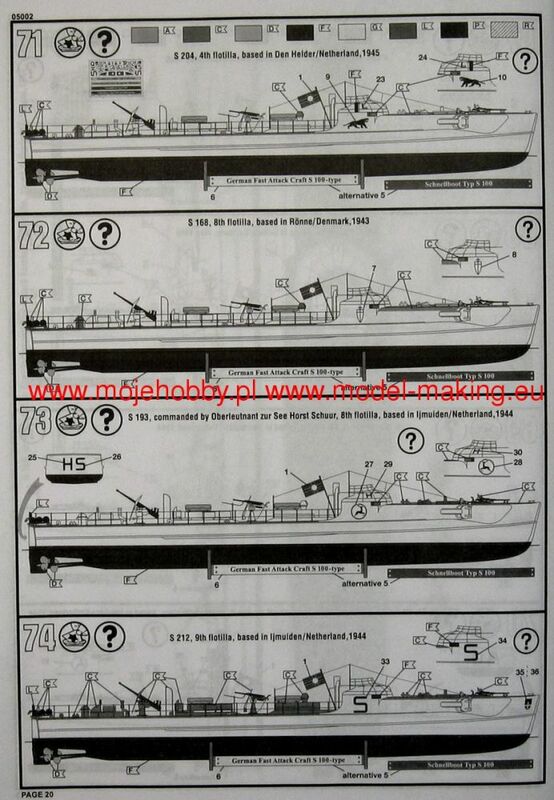 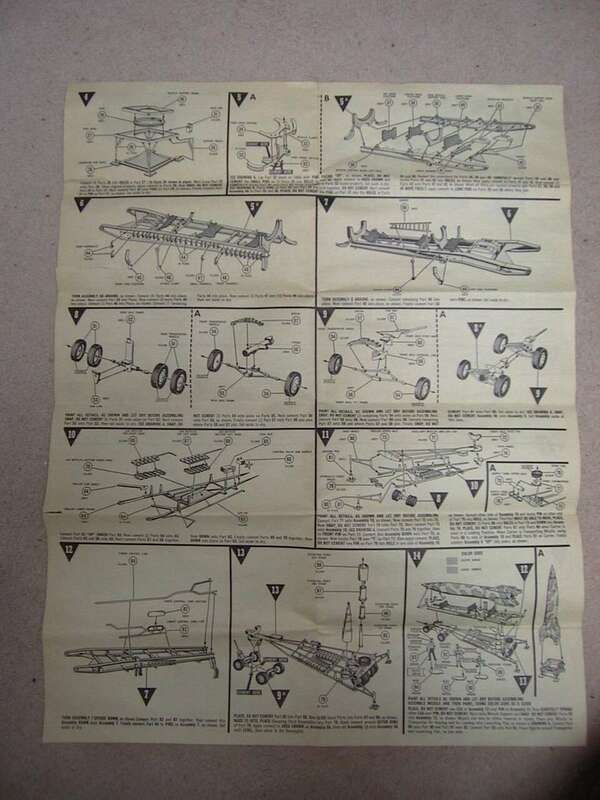 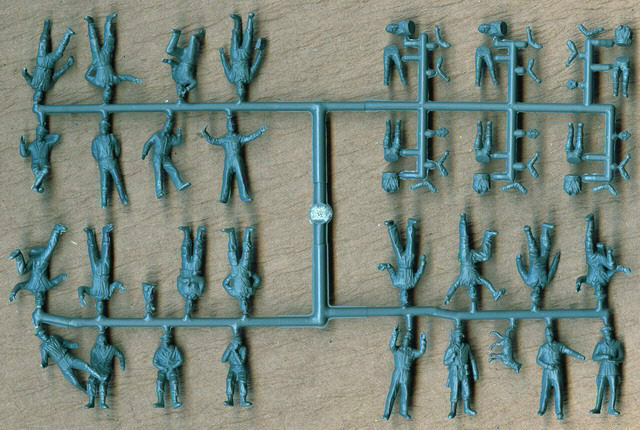 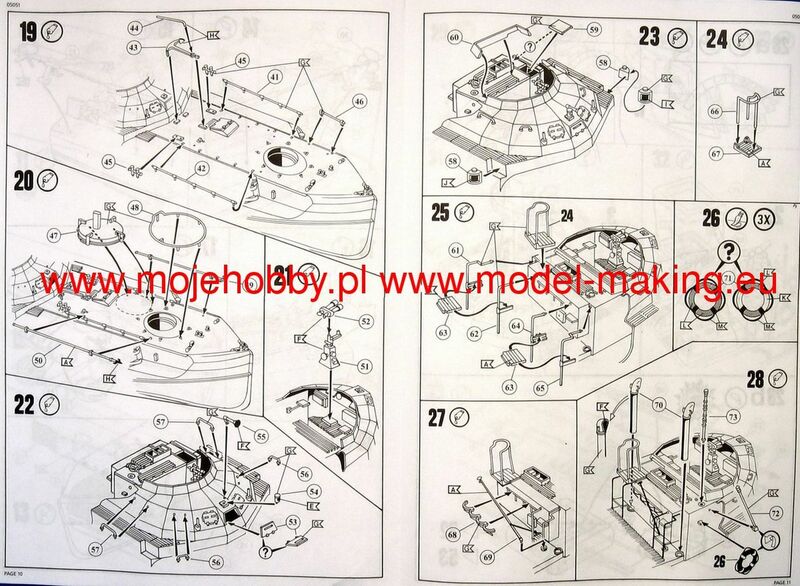 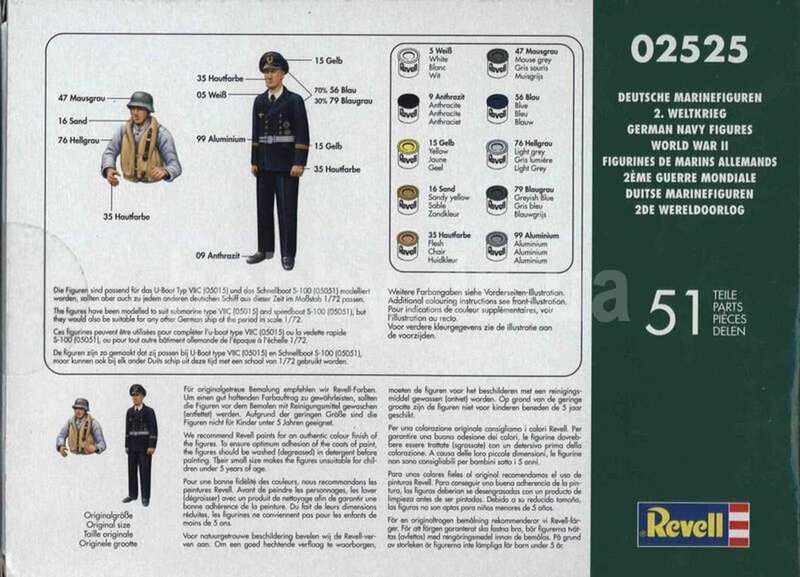 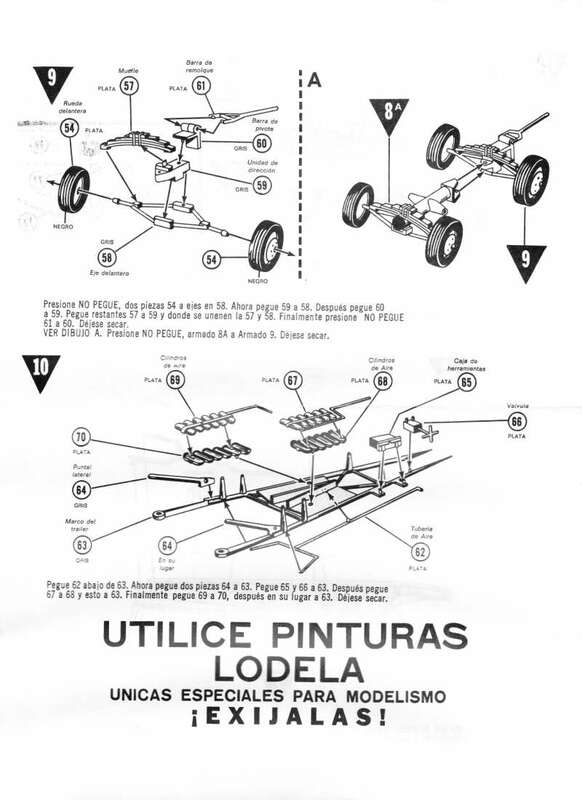 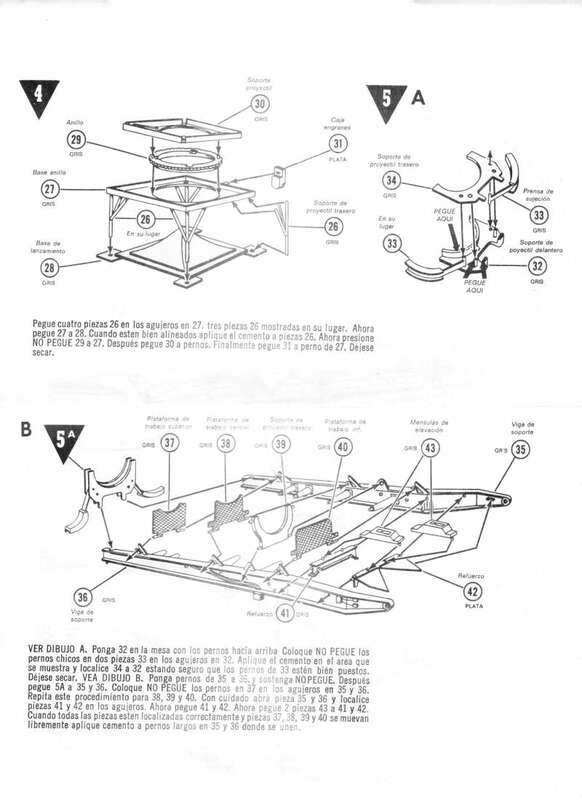 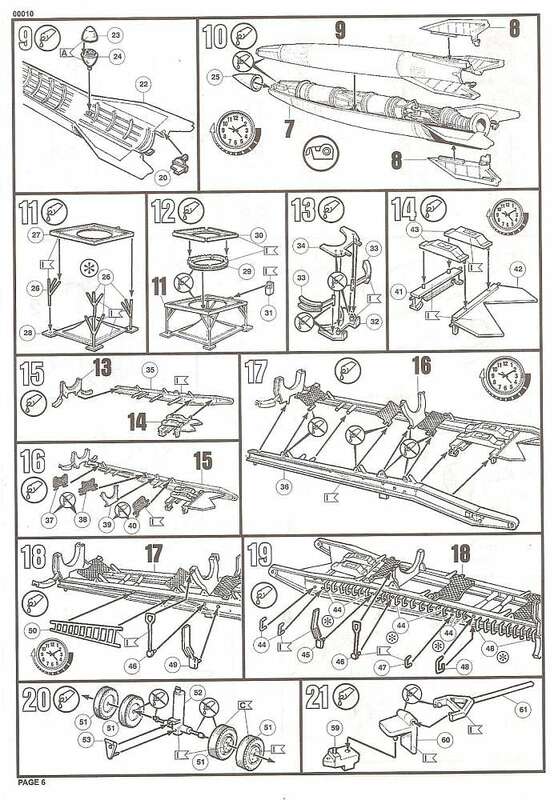 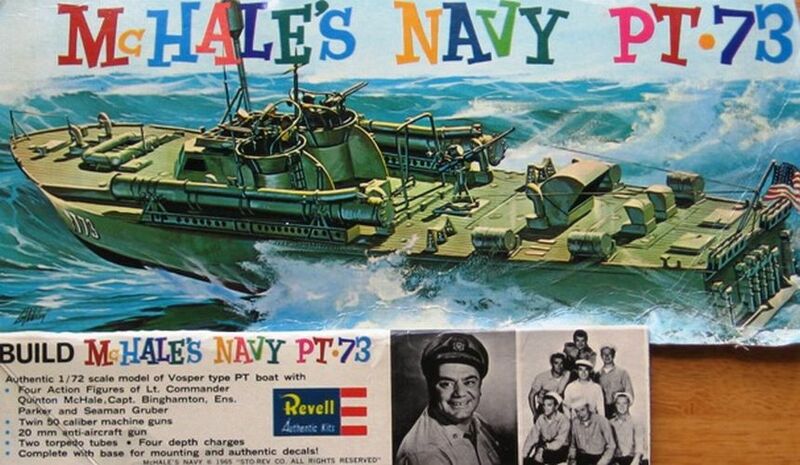 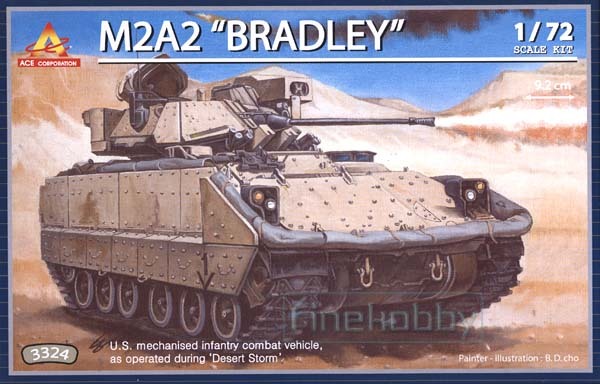 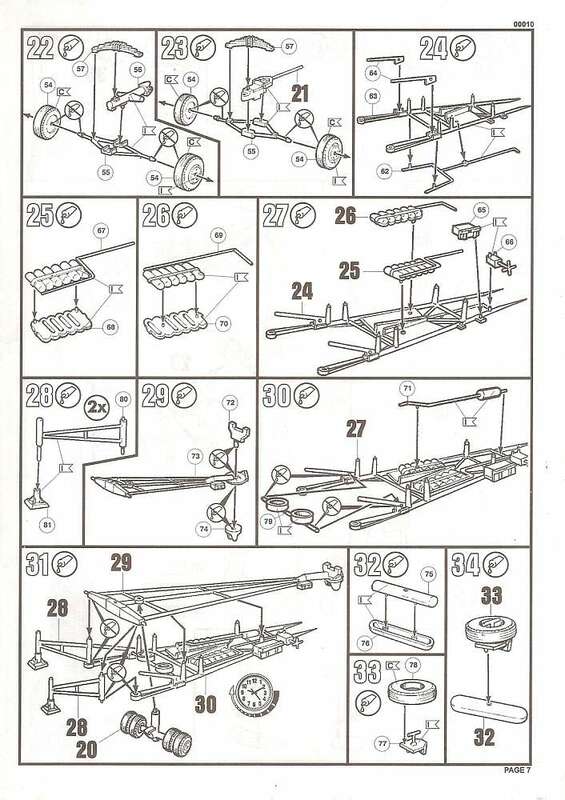 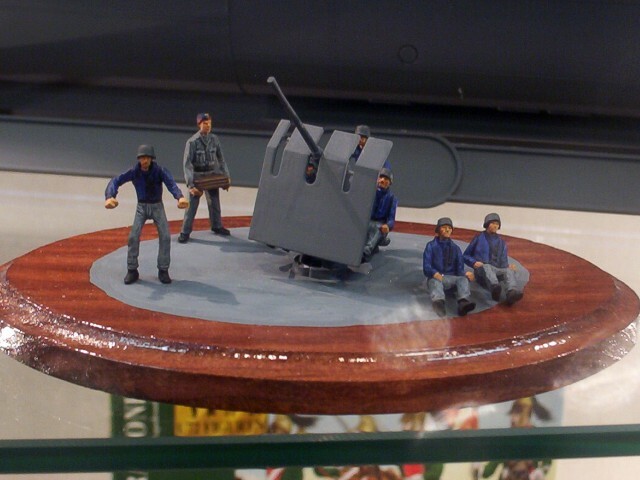 NONE of Revell or HELLER kits in the small scale (1/76 & 1/72) was made in Brasil! 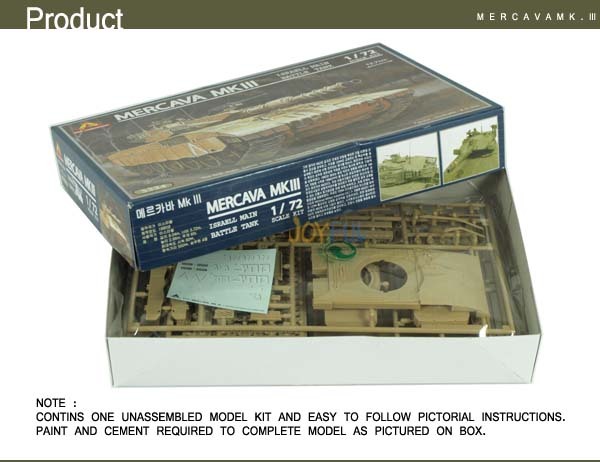 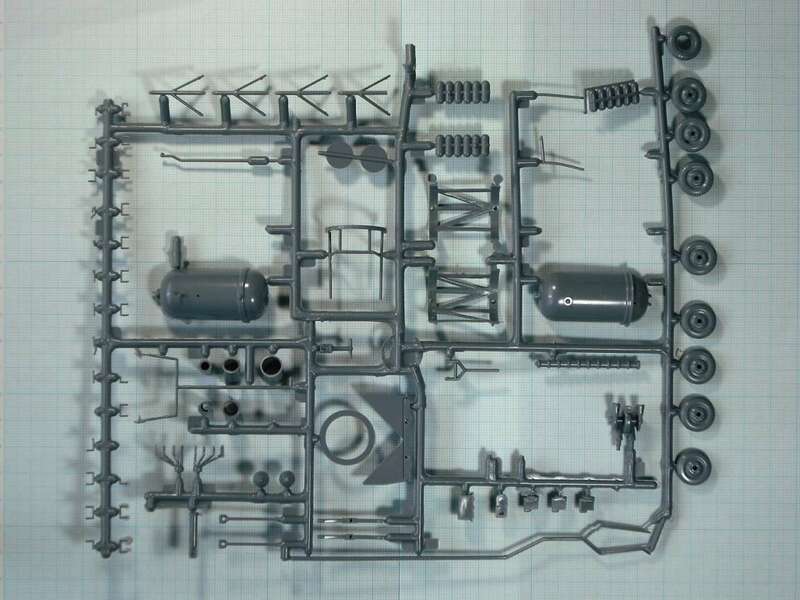 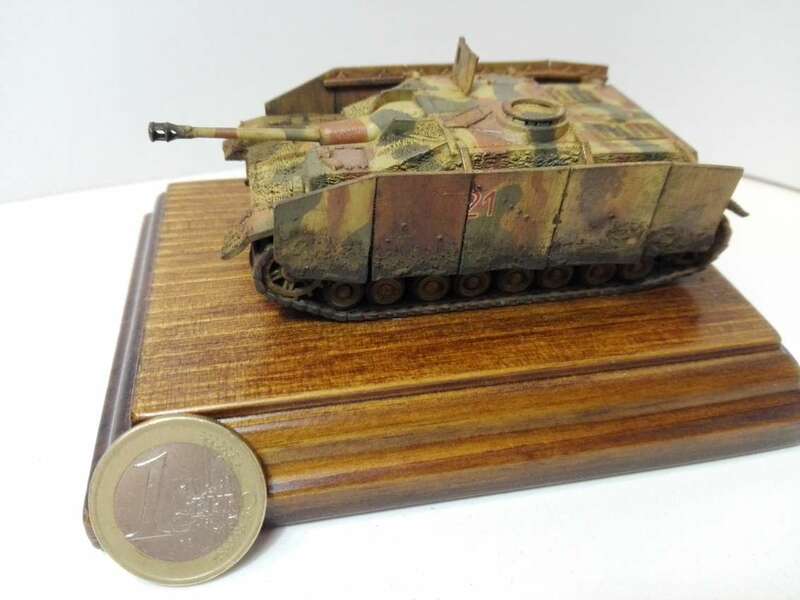 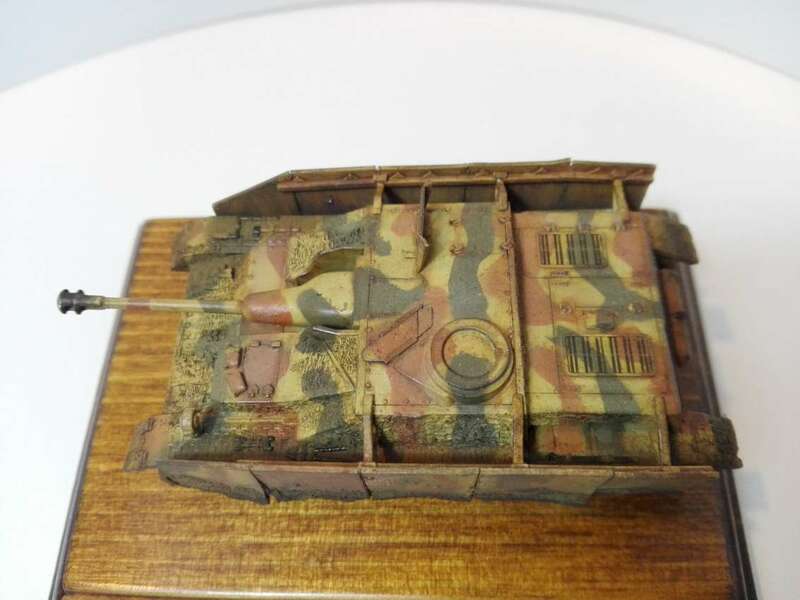 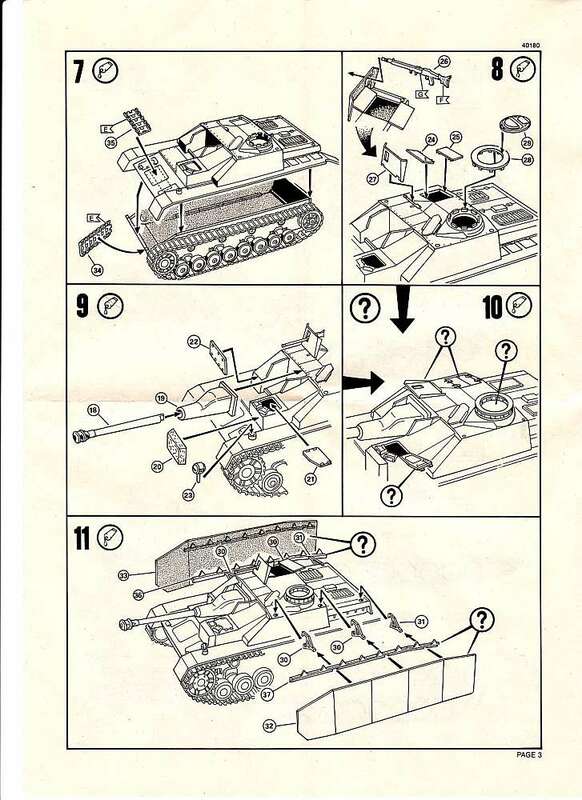 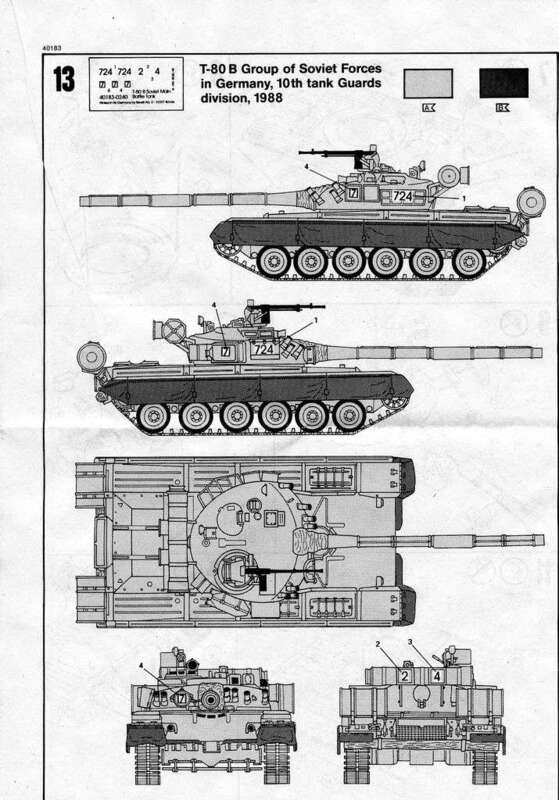 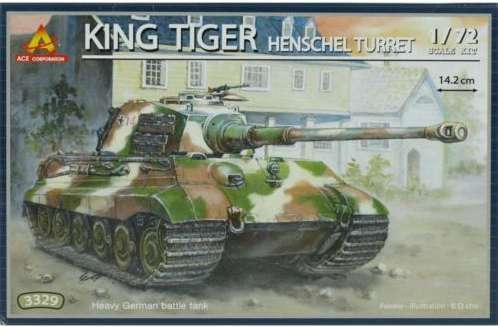 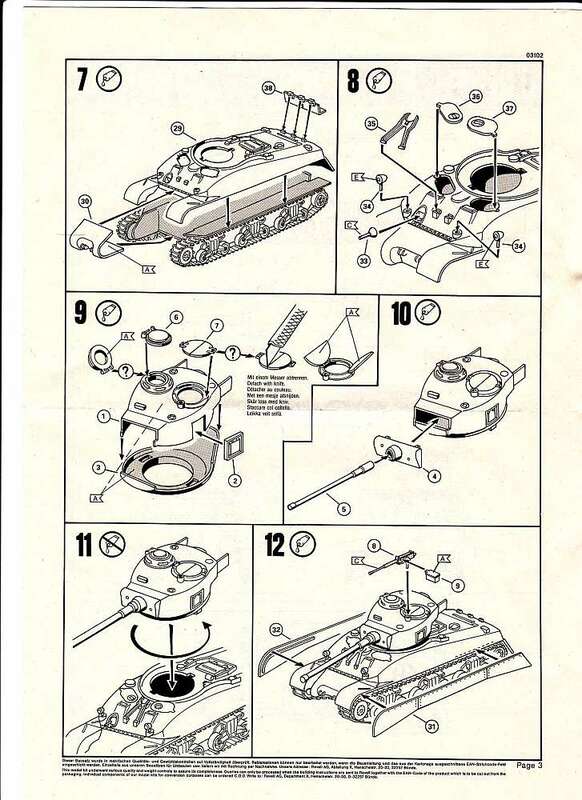 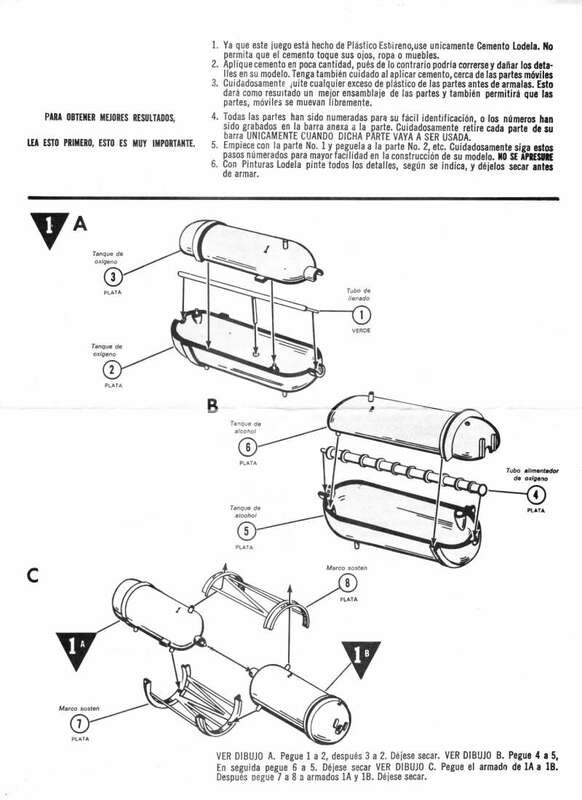 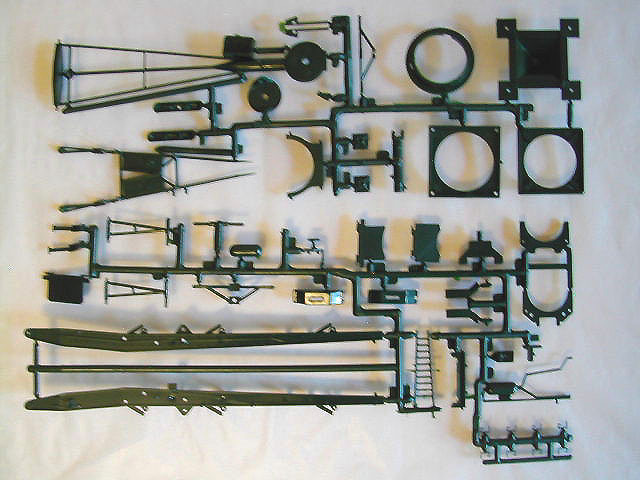 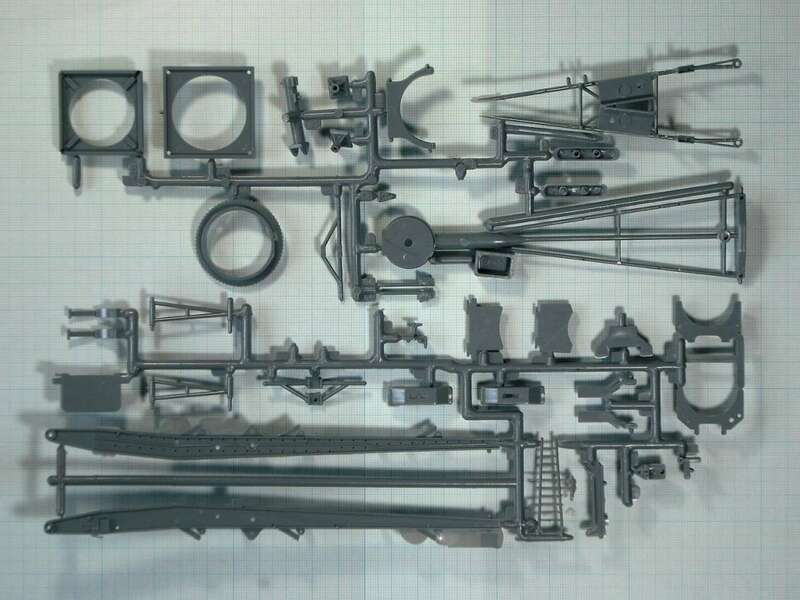 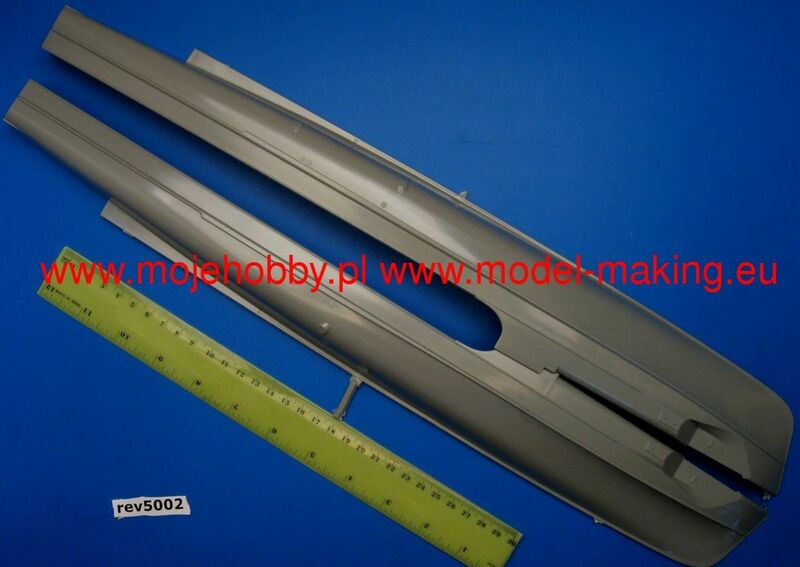 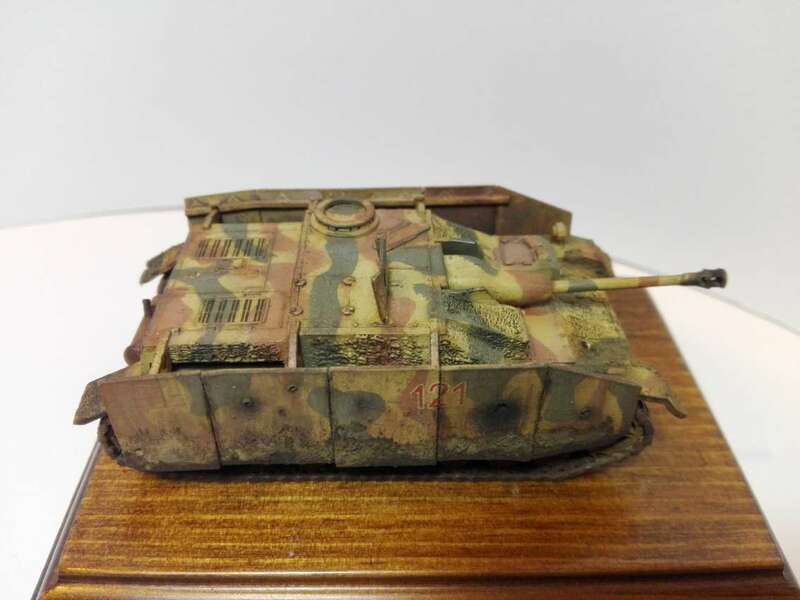 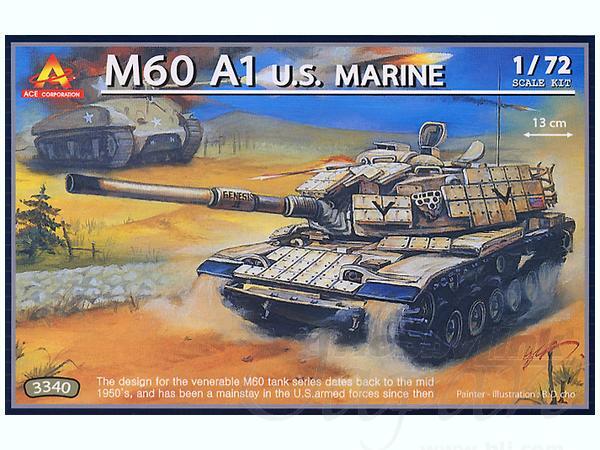 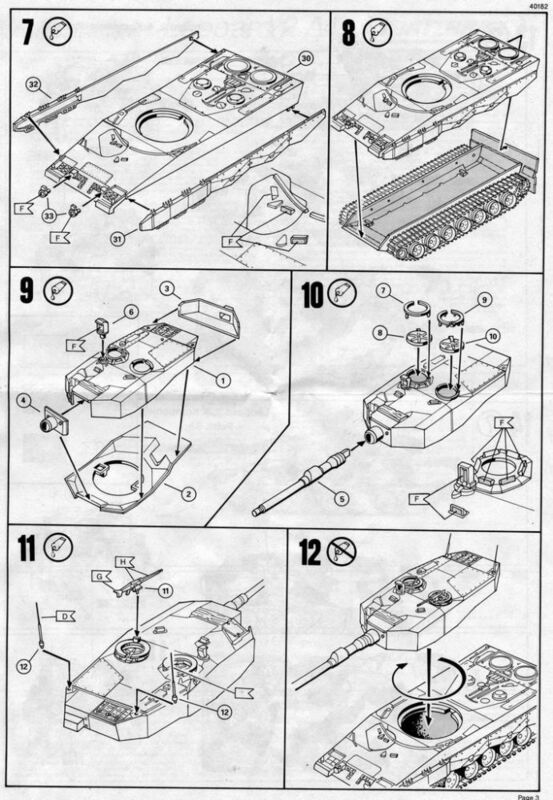 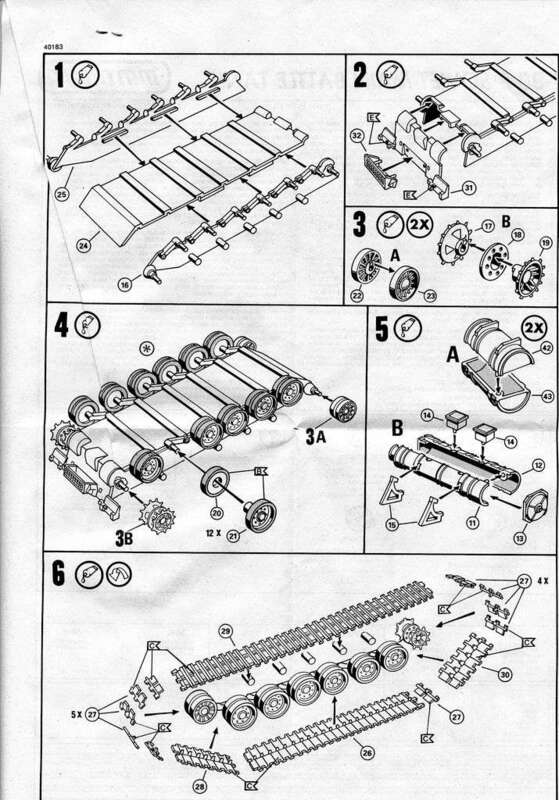 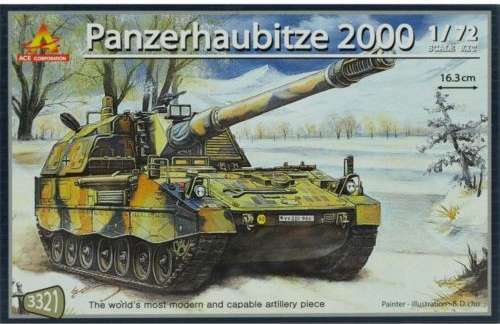 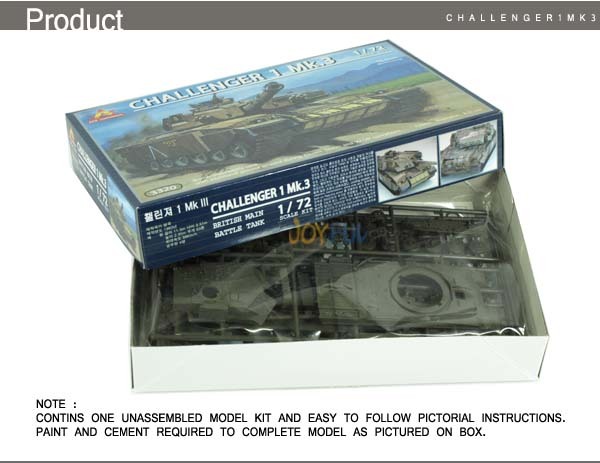 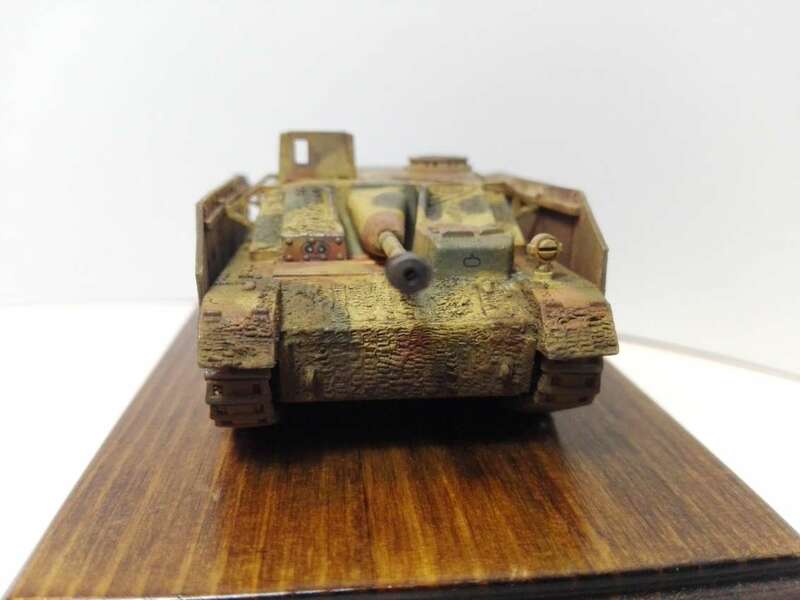 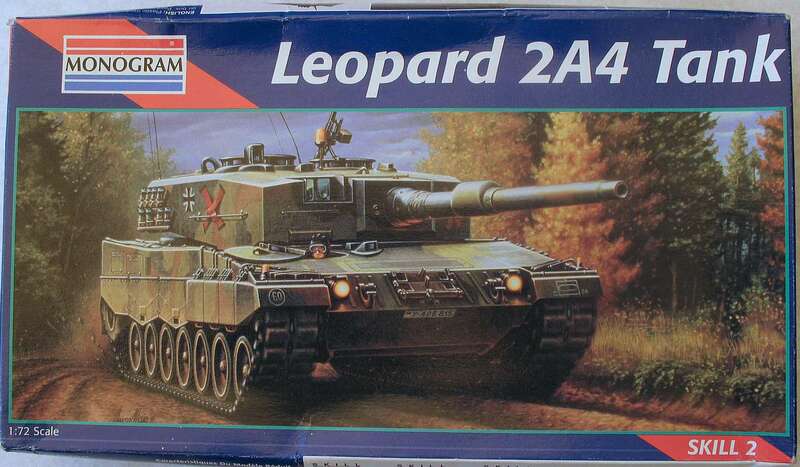 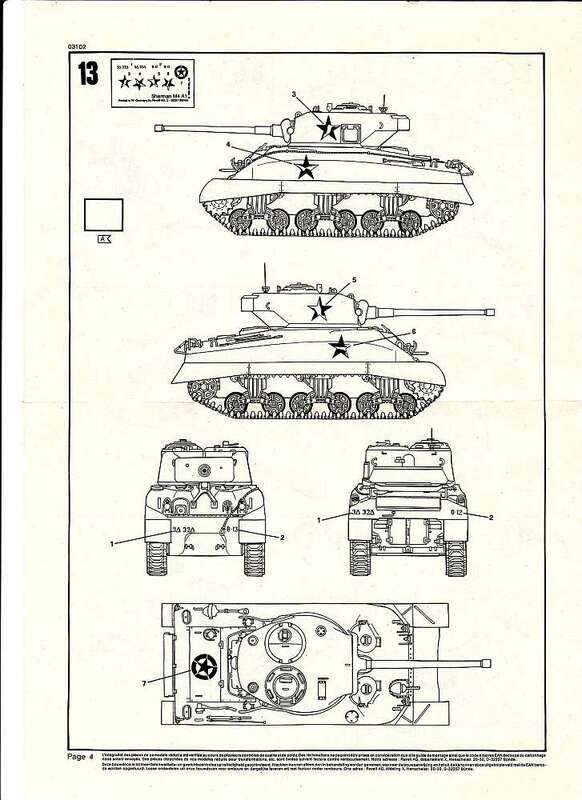 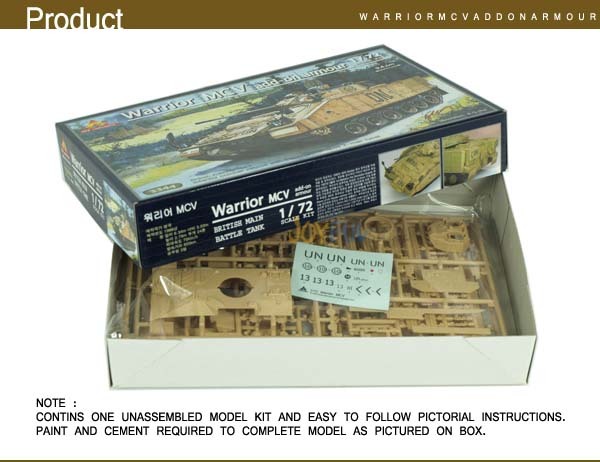 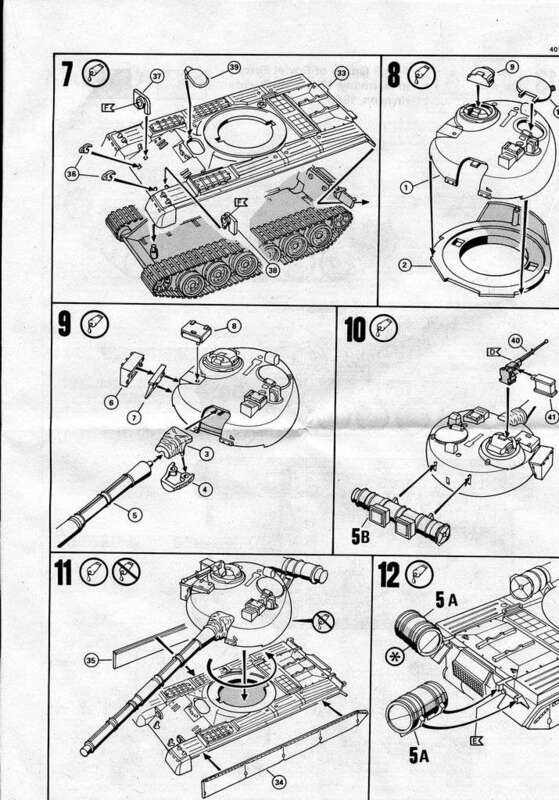 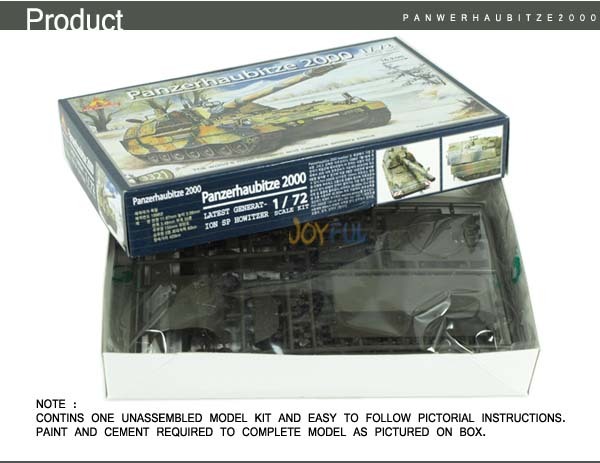 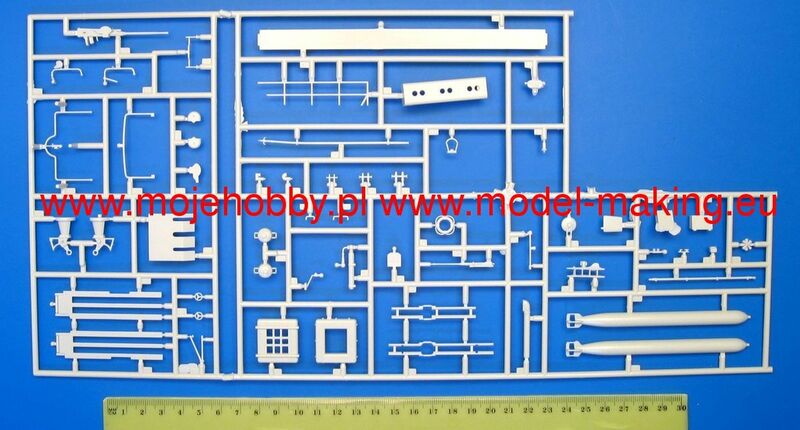 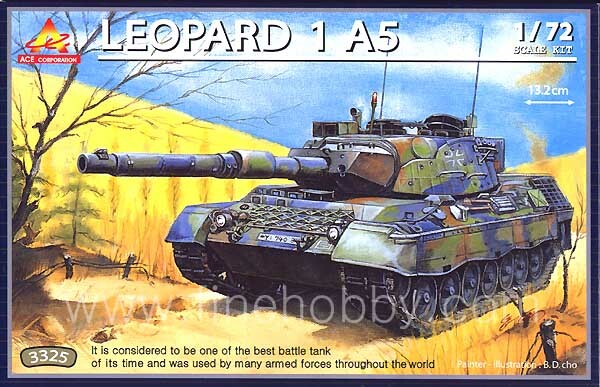 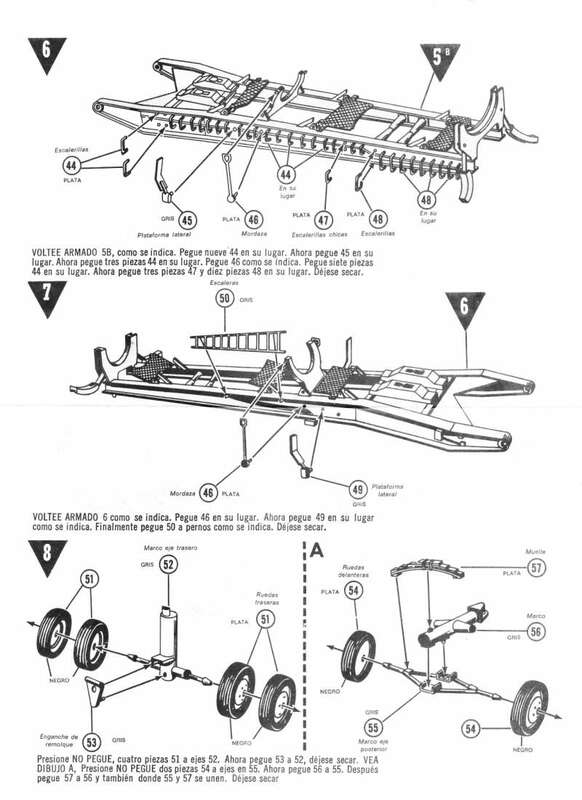 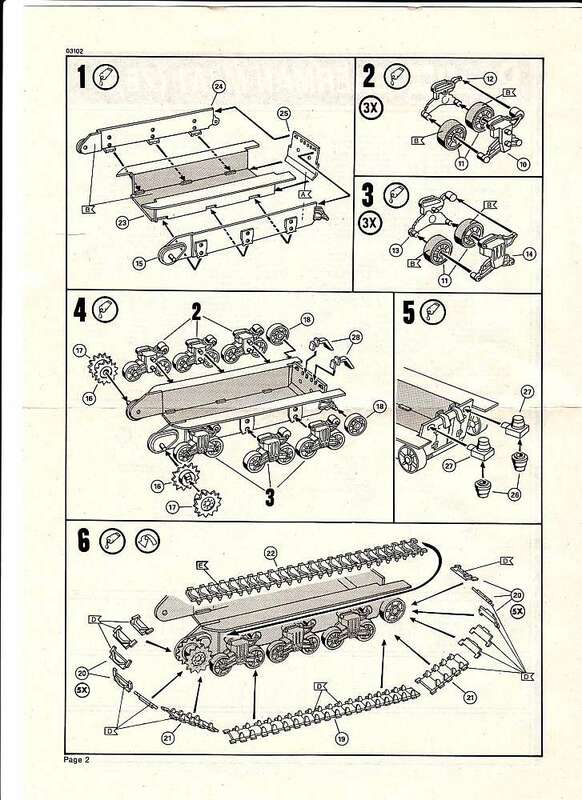 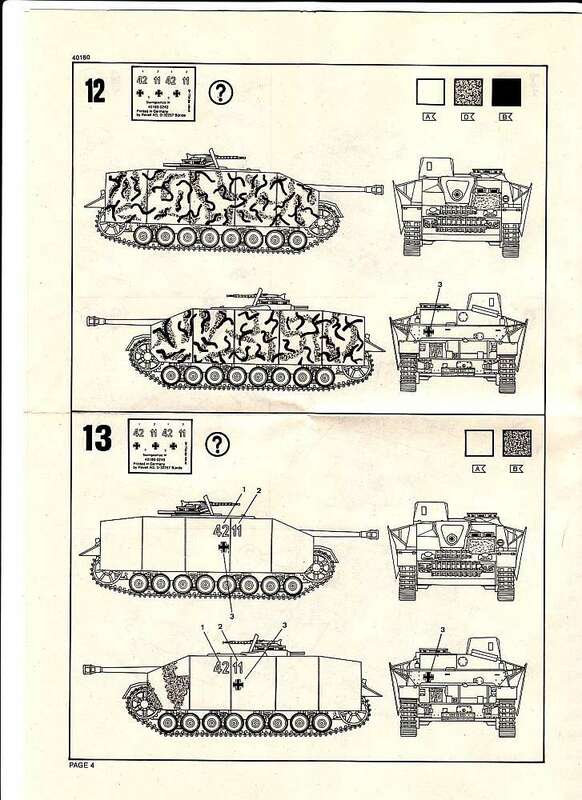 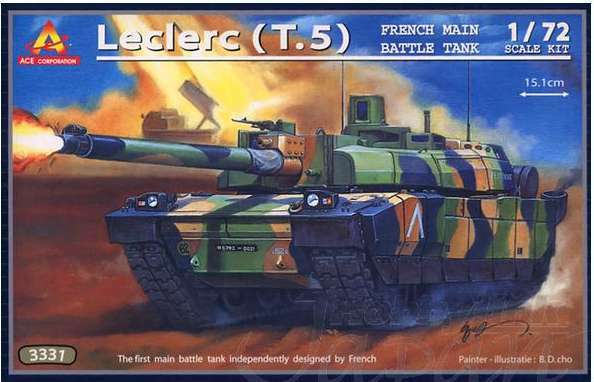 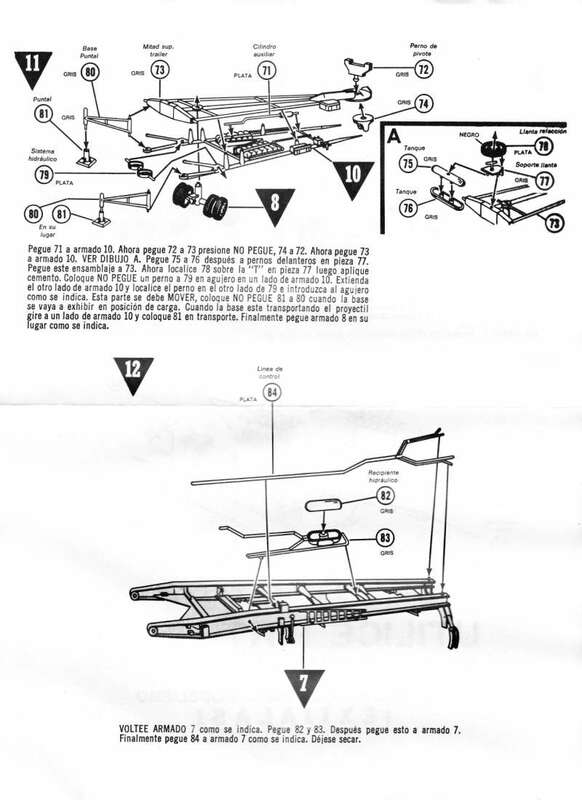 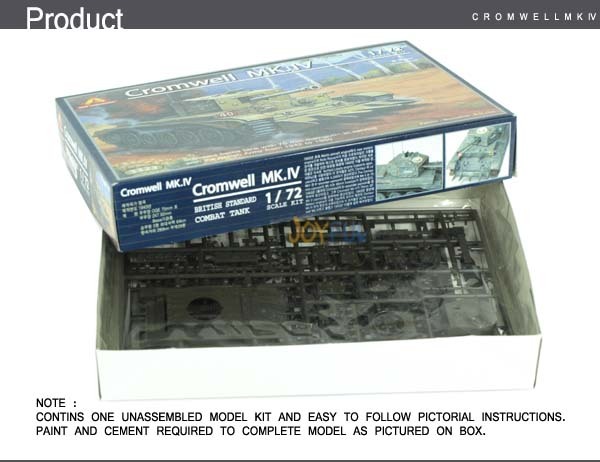 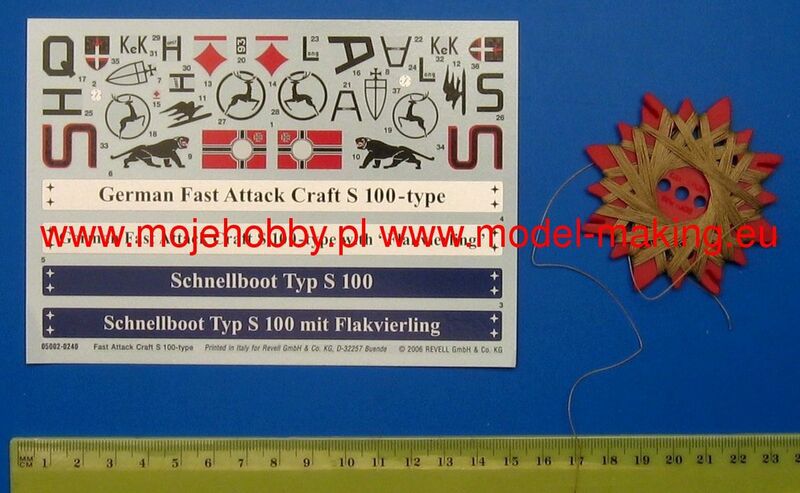 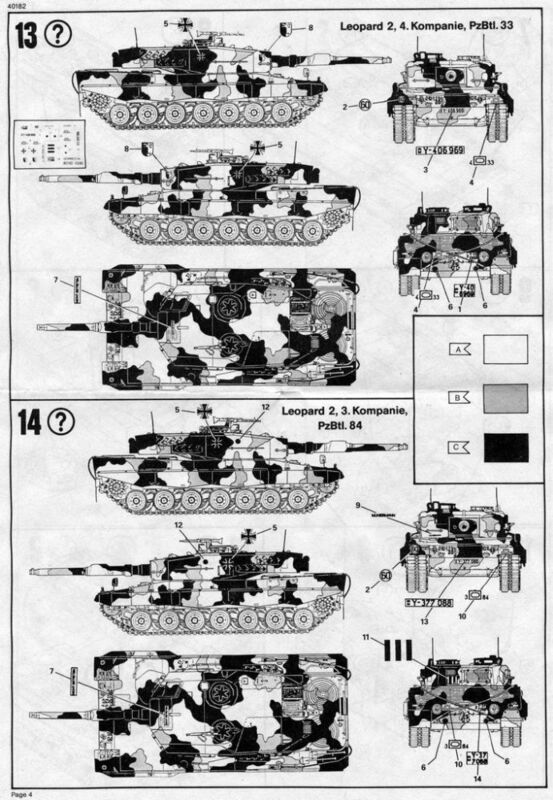 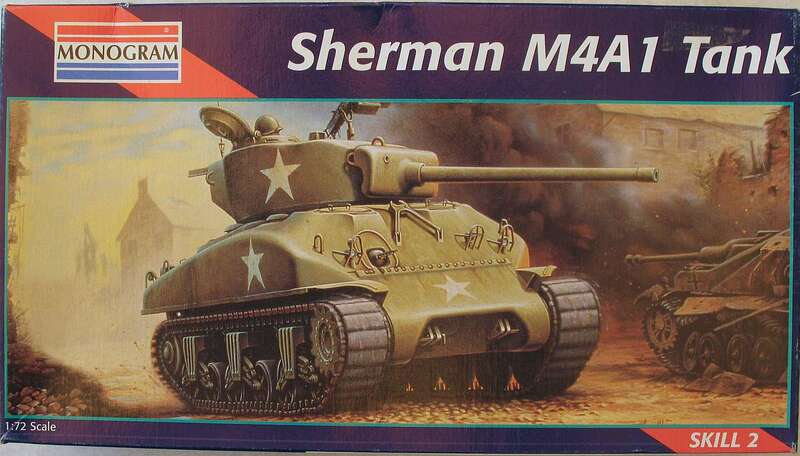 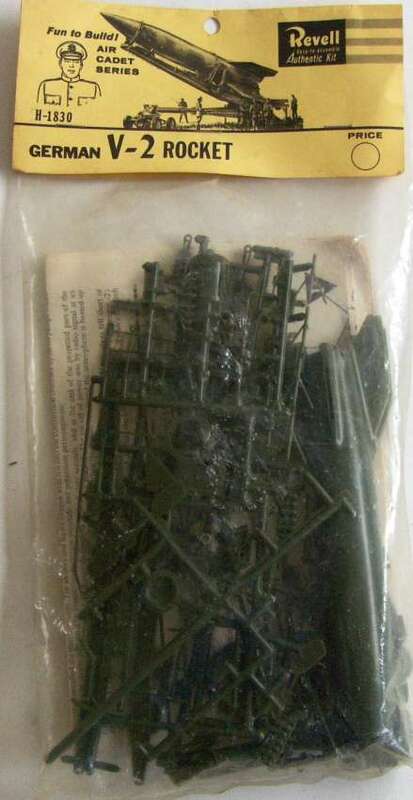 But several in the not standard scales as 1/40 scale - or other scales - (M-48 bridge layer, T-34/85, 105 mm gun, Sherman tank, Self propeled gun, U.S. 6x6 truck etc...), this are all Revell 1960's kits, Aditionally Snaptite Panzer and Sherman on the 1980's. 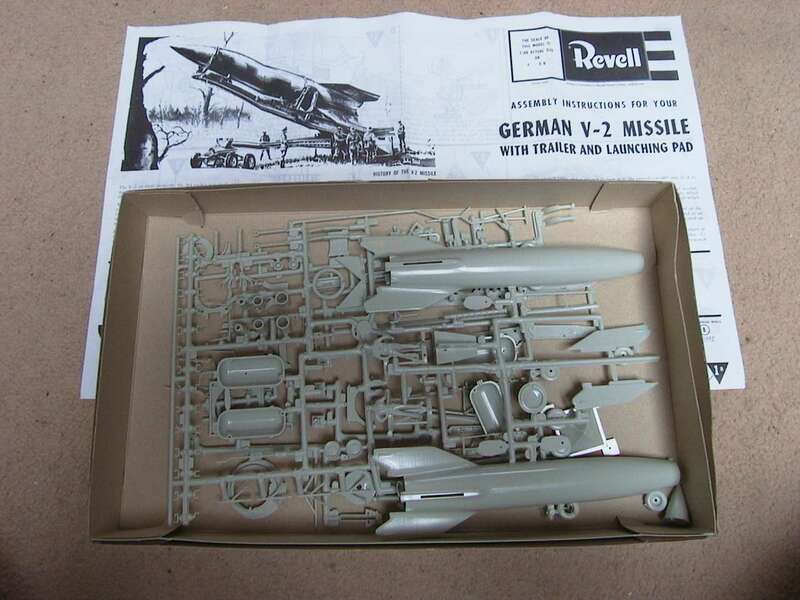 For more information do an search on Google with the items "Revell KIKO" and for the Mexican distributor/producent "Revell Lodela".